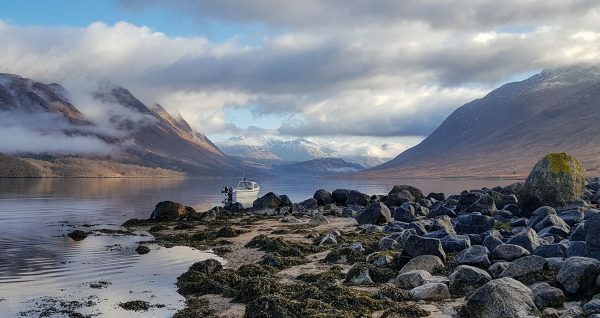 A fine couple of camp’n’fish trips to Etive kick off 2019. 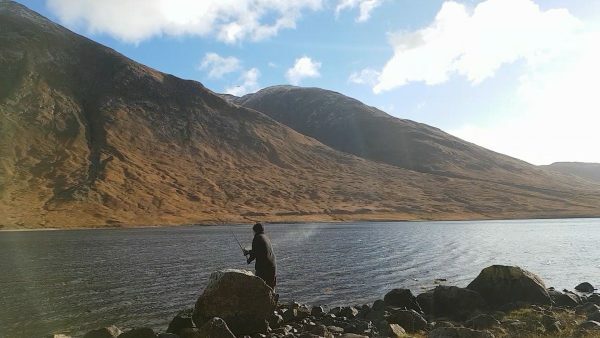 My usual post-Christmas boredom dragged me out the house for a solo trip on New Years Day, heading west for a 2 day fish’n’camp session over at Etive. 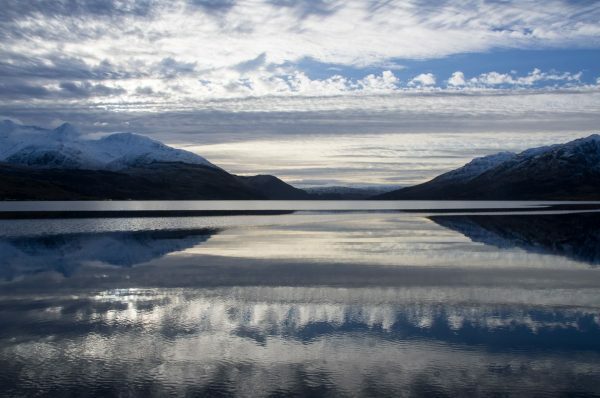 I trailed the boat over, and was soon heading northwards up to my favourite haunts in the waters of the upper loch. Clipping on a 40g silver Koster quickly resulted in a take and a rather underwhelming little pollack became my first victim of 2019. I can only hope his bigger brothers want revenge later in the year! 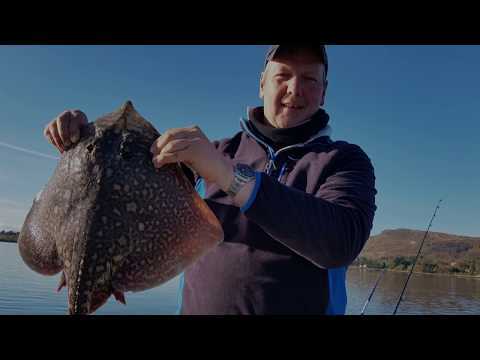 Apart from my one pollack it was very similar to recent trips, with loads of small spurs and a couple of tiddler rays. It did turn into a fine evening though – calm, cold and clear, and just as I like it. Mooring up just off the eastern shoreline, I set up camp in the last of the light. 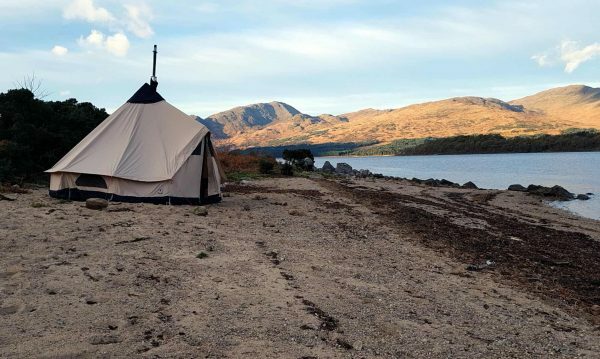 This was the same spot Ian and I went glamping a couple of months back but just with the small tent this time. 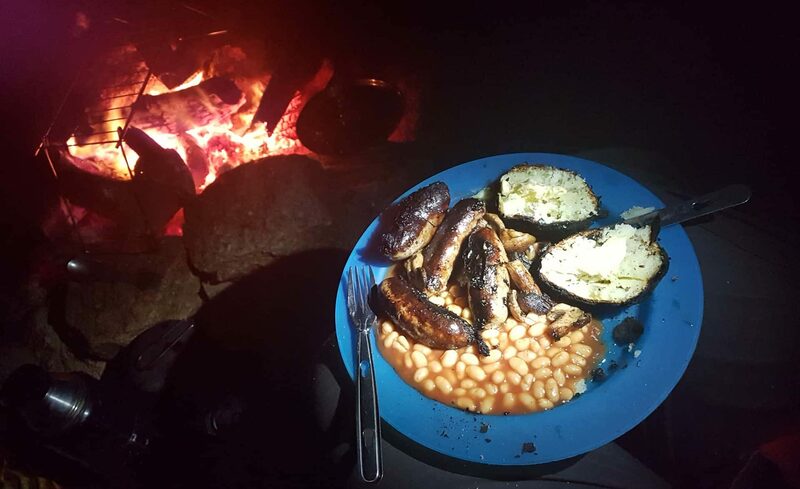 Dinner was simple – sausages, beans and baked tatties, all cooked on the beach in the heat of my campfire. I’d a few casts from the shore whilst I waited for dinner to cook which produced a spurdog followed by a pair of varifocal specs, presumably lost by some careless boater over the summer. Makes a change from crabs, anyway! Next morning was fine and calm, with crispy frozen sand crunching under my feet. My not-so-smart phone tried to tell me it was -11C, but I doubt if it was any lower than -5. Still chilly though! Camp struck, boat retrieved, and then it was time for a few more hours on the water. I’d love to say there were monsters queueing up, but the reality was a long line of small spurdog. A couple of days at work, and then Trevor and I met up at Taynuilt last weekend for a repeat performance. 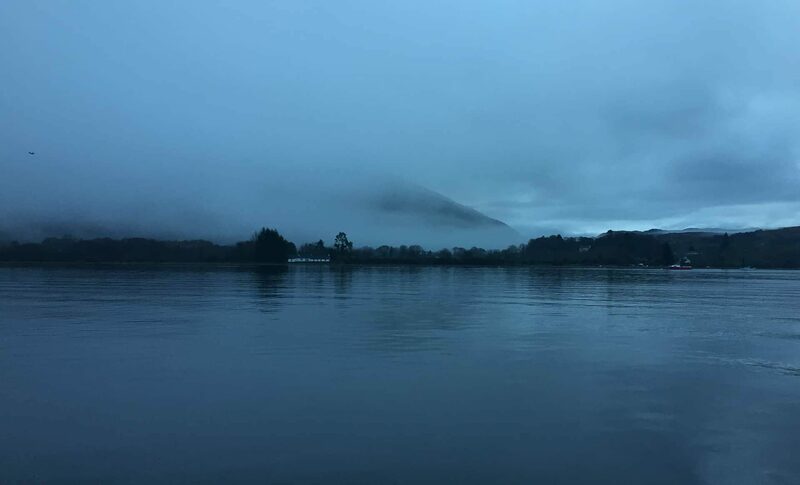 Launching into the gloom of a misty Highland dawn we spent the morning on a couple of marks around Airds and Ardchattan. The usual small thornbacks and spurdog put in an appearance, but we caught no surprises. By early afternoon we decided to head up to our campsite and get set up in daylight. Style – but real mid-winter comfort too! 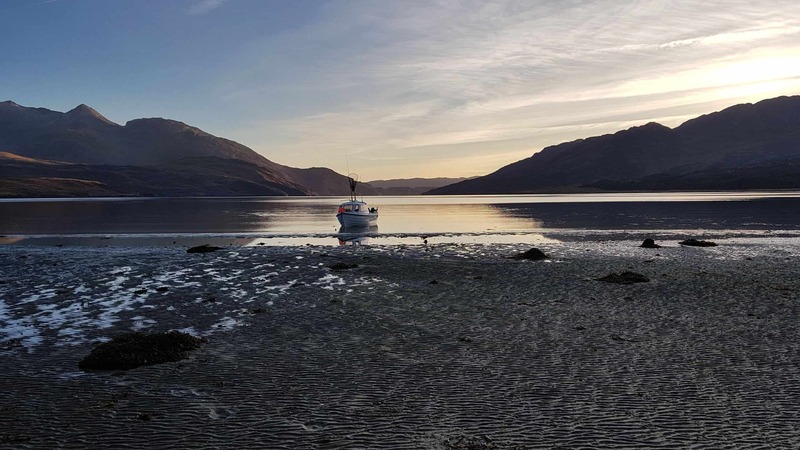 A couple more hours afloat, chasing fairly small stuff, and we edged our way cautiously back to camp and set up a temporary mooring for the night. 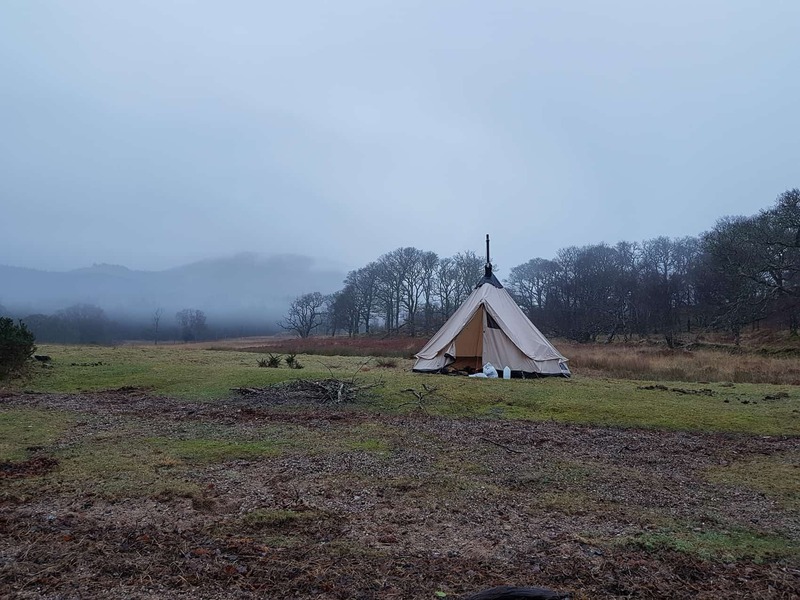 The weather was calm but a bit misty and drizzly, so the big tent was a huge improvement over dodging drips in a glorified bin bag – and just as warm as our previous experience with the woodburner. 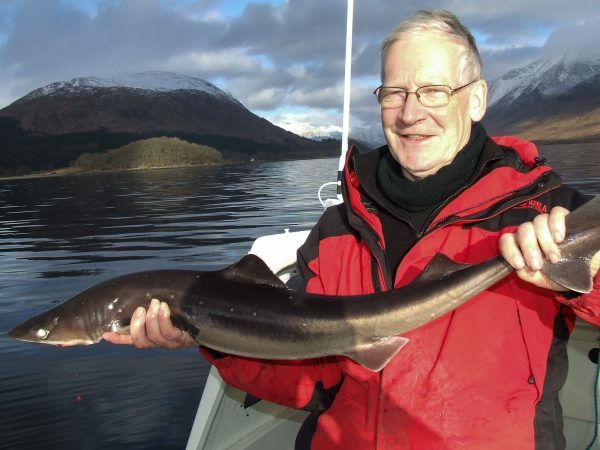 Trevor wasn’t feeling so good that evening (I put it down to chewing rotten mackerel), so I swallowed a dram on his behalf before hitting the sack. 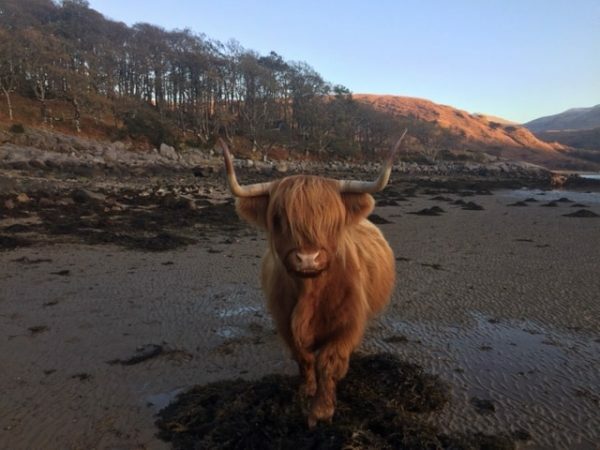 The highlanders (cattle, not human) that evicted Ian and myself last month had moved on to terrorise the occupants of Cadderlie bothy so we had no visitors overnight. Next morning we awoke to an almost surreal sight in the early morning mist, as my boat appeared suspended in cloud rather than floating on the water. Floating or just suspended in the clouds? As the light strengthened so did the drizzle, and we were happy enough to fire up some bacon rolls and coffee rather than make a dash for the sea. Eventually, though, we packed up the gear and overloaded the boat again, before heading out for a few more hours. 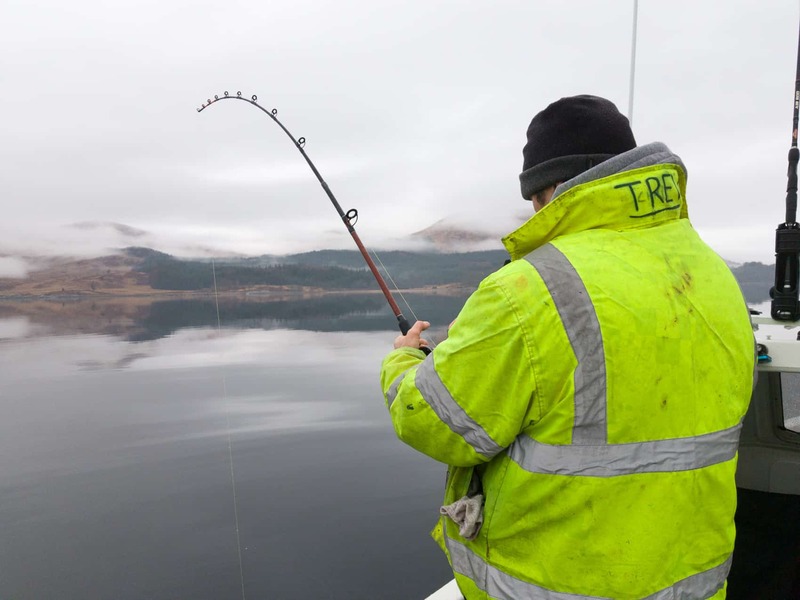 Trev was perkier again this morning, and soon began to cuff in fishing terms. 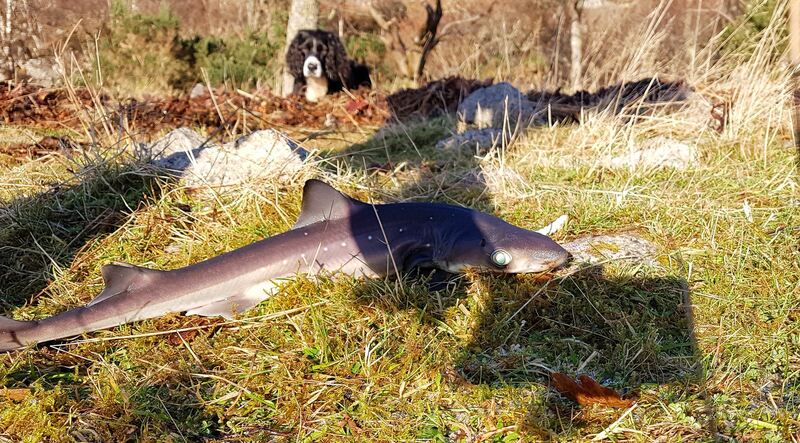 I don’t much care when it comes to the smaller fish, but I woke up when he picked up a 9lb spurdog in the deep trench off Barrs. Sadly, this was as good as it got and we spent most of the time dealing with relative tiddlers. 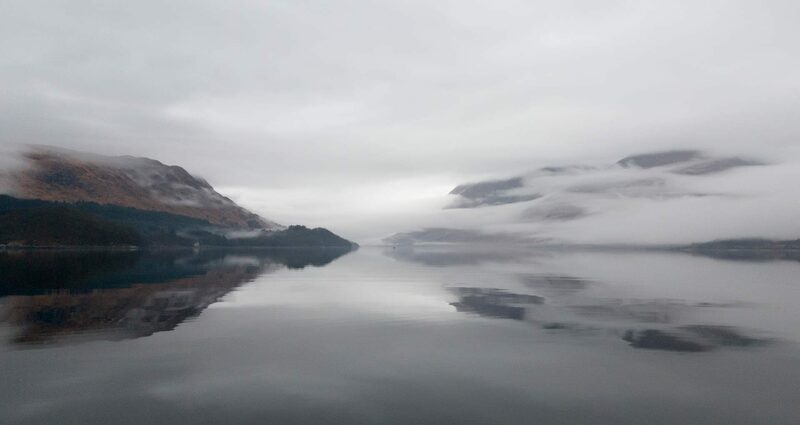 However we could hardly complain about our surroundings as even the mist highlights the beauty of the loch. 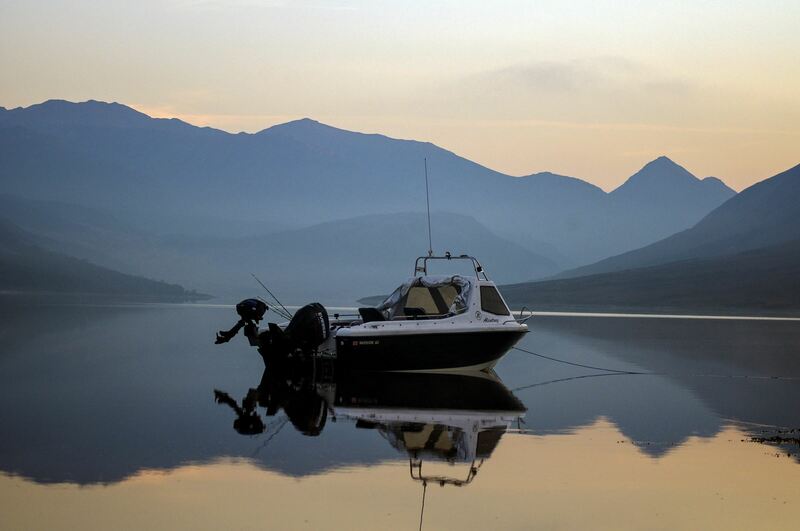 And, having spent 5 days in the last 2 weeks afloat on Etive, I might give it a rest for a little bit! 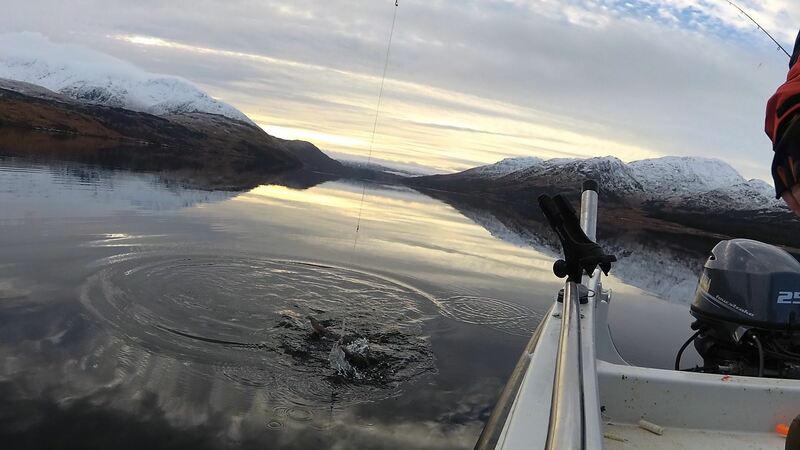 A kind of slow burn day afloat on Etive with Ian – but with a bit more action later in the day. 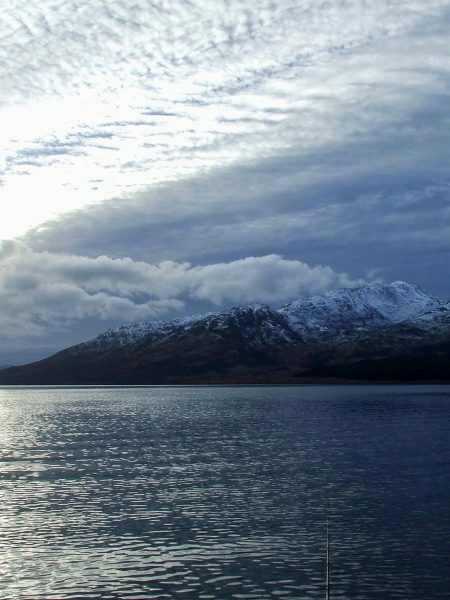 Kelly’s pier looked distinctly drab and unwelcoming as Ian and I arrived at Etive in the grey light of dawn. 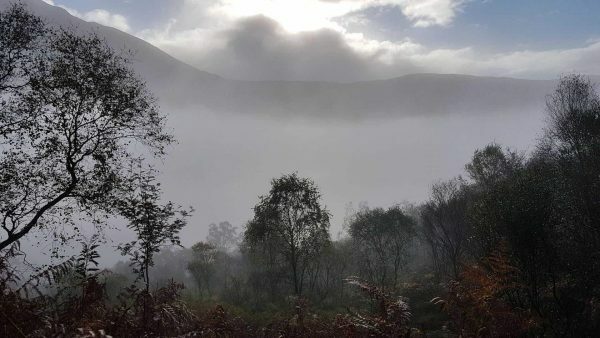 The winter solstice had just passed – although it didn’t exactly feel like we were charging towards summer as thick fog sucked the heat from our bodies. At least not so much as a ripple disturbed the loch surface. 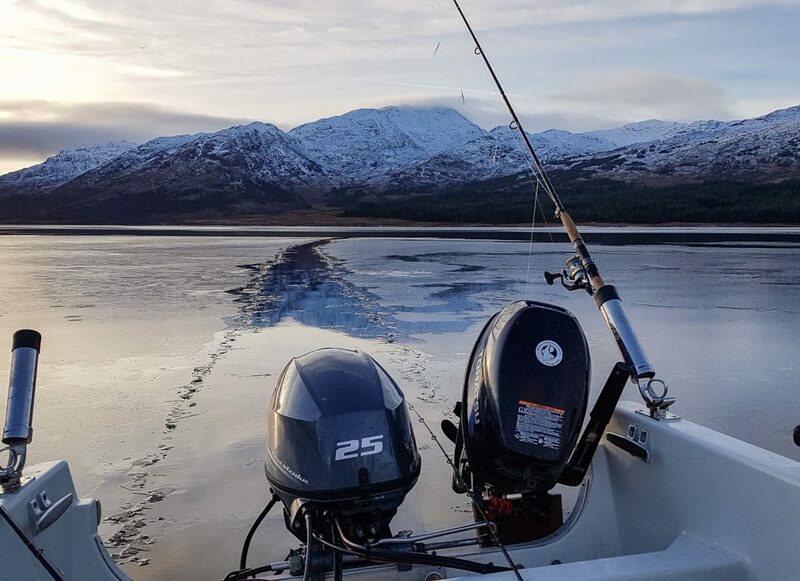 Clearly not conditions to hang about, so we launched as efficiently as Michelin man clothing allows and headed down the loch. We planned to try a couple of new spots, given generally poor results from our usual marks in recent months. 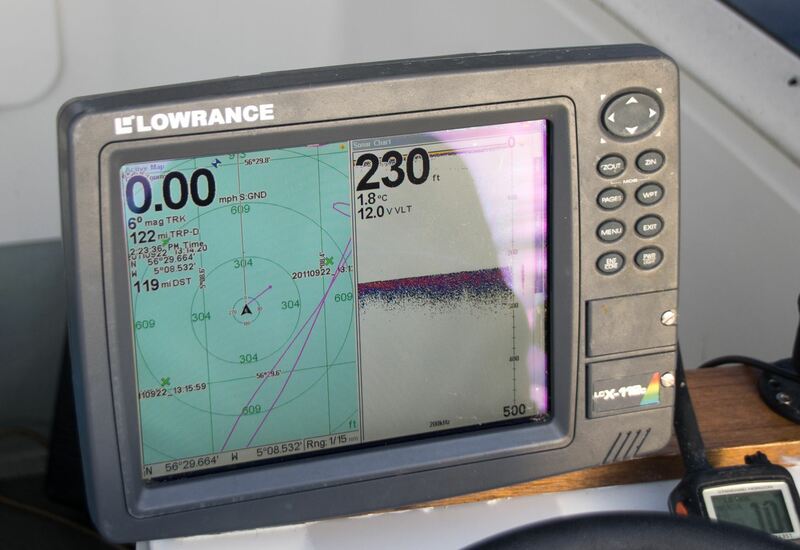 We detoured slightly to locate a small wreck lying close inshore but decided to leave it to the divers this time round. Our first stopping point was a hole in around 100 feet of water, largely surrounded by shallower banks and close to a decent shore spot. 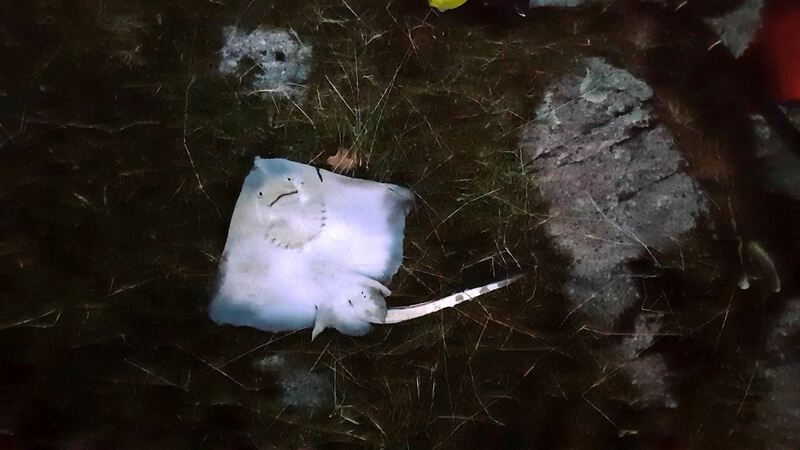 I was fairly hopeful as we dropped a variety of baits onto the sandy bottom. 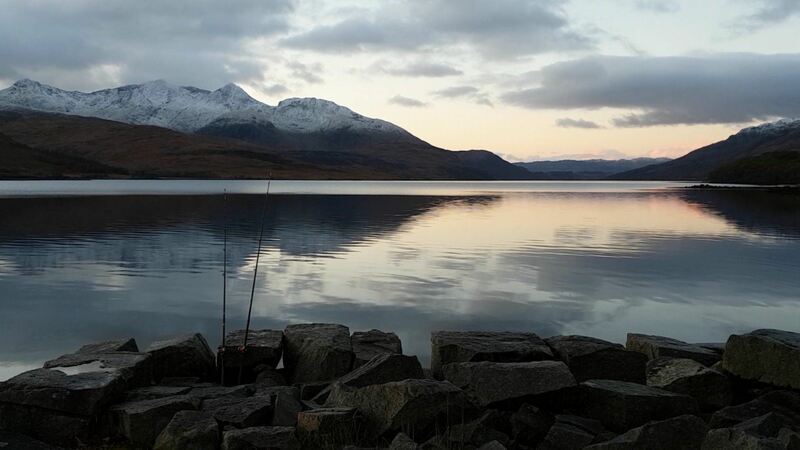 However, 90 minutes and a single grey gurnard later we headed across the loch to location number 2. Another 90 minutes with nothing but crabs to show for our efforts and any optimism suitably crushed, we retreated to a deeper mark. 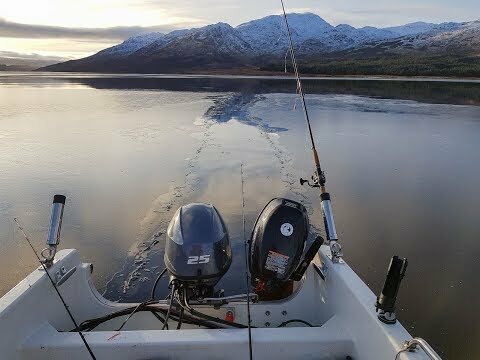 The sun was out, and morale soon improved as we started to pick up fish and our feet thawed just out a little. Ian did his usual, trashing me in the thornie stakes, and we both picked up a range of small spurdogs. Similar to the last time we fished here, but with no sign of anything larger. With dusk not too far away we decided to make a final shift up to a mark in deeper water. 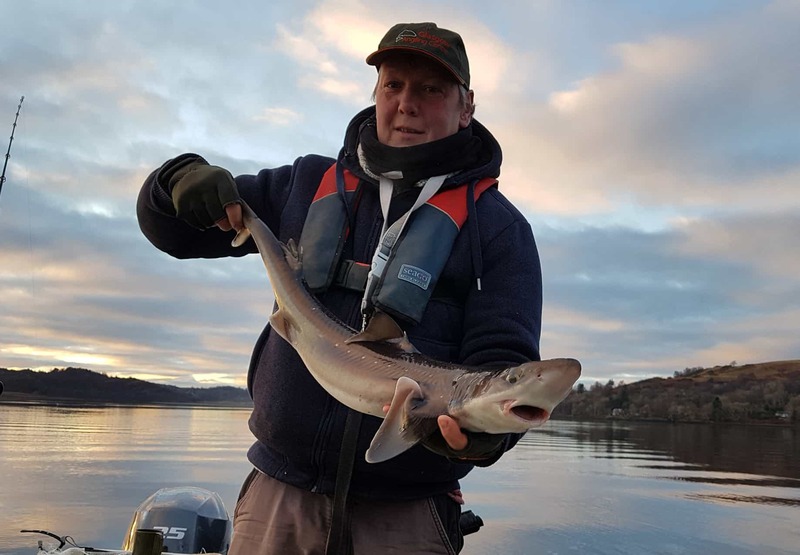 I’ve not fished up here for a couple of years but it has thrown up a decent mix of species in past seasons, and it didn’t look like we’d much to lose! At 220 feet it was a bit deeper than the spots we’d tried most of the day. 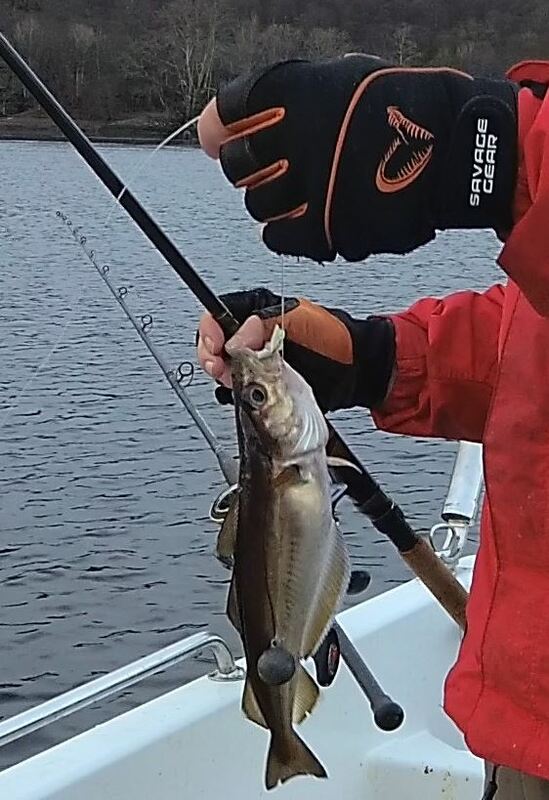 I don’t know if that was the reason or not, but the fish seemed ready to play. 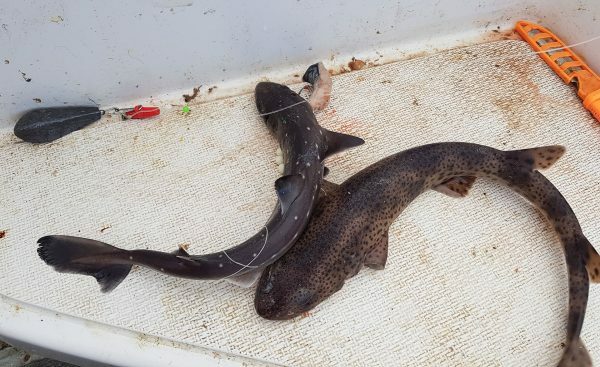 We’d a mix of spurdogs and a handful of ray. 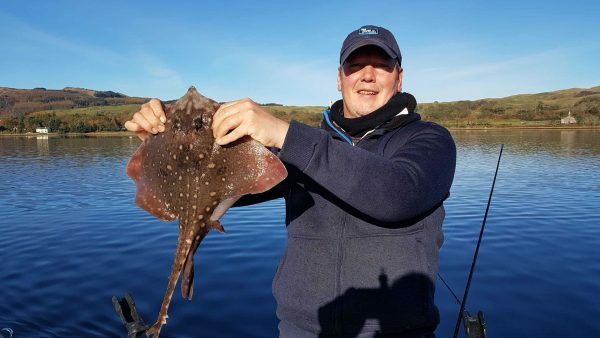 All fairly small until Ian hit into a fish that was clearly better than the titchy stuff. 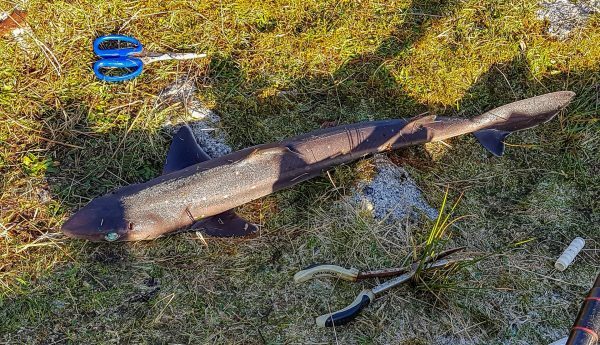 Being faced with something that pulled back was a bit of a surprise after all the little pack fish, but it didn’t take too long to surface a nice spurdog. Not weighed, but somewhere around the 8-9lb mark. My turn next as a good run resulted in a fine bend on my rod and a suitable feeling of solidness. A few minutes later and a very plump female spur appeared in the net. This one was weighed and just crept into double figures, at 10lb 2oz. Still, my first double figure spurdog for some time now! 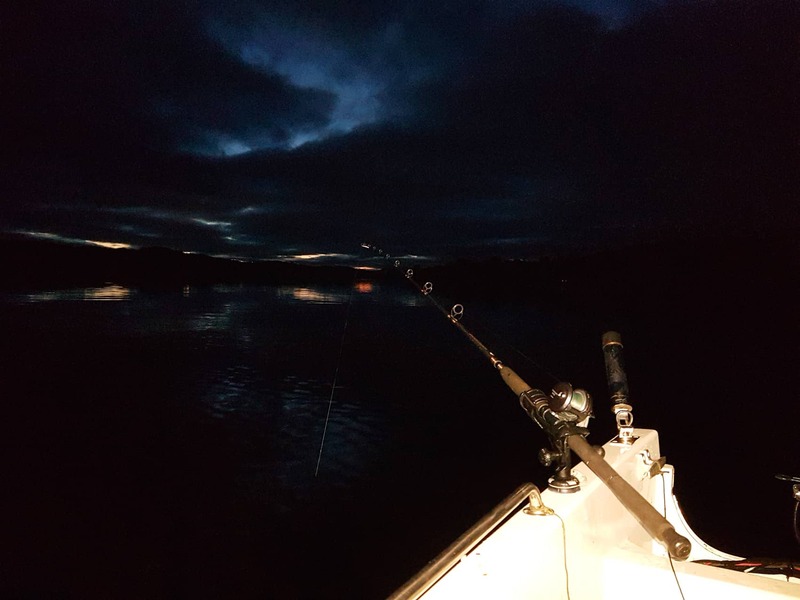 We fished on into darkness for about 90 minutes, taking advantage of a fine, calm evening. 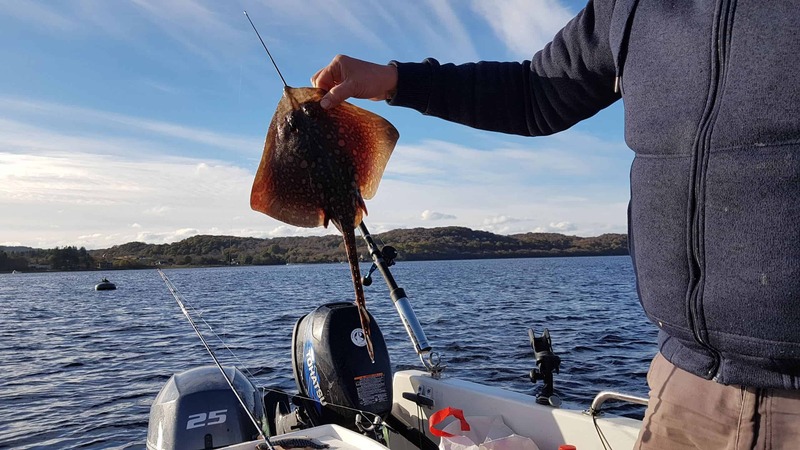 Sadly, although we picked up a further sprinkling of ray and spurdog plus a couple of whiting, there were no more doubles on offer. So I’m quite happy with my Christmas prezzie from Etive, although the day shows how unpredictable a place it can be. Nothing to show for the morning, followed by decent numbers at marks not too far away. 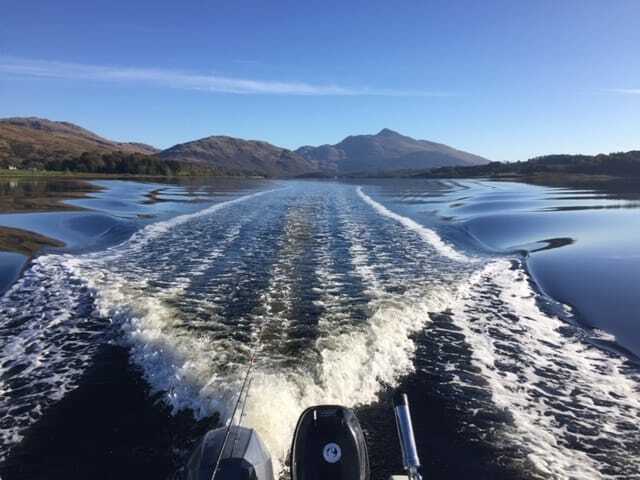 The Longliner 2 slipped into the calm waters of Taynuilt and we were soon running down to our usual starter mark at Ardchattan. An hour or so here produced very little, so it was on to the deeper spots offshore from the Priory shore mark. 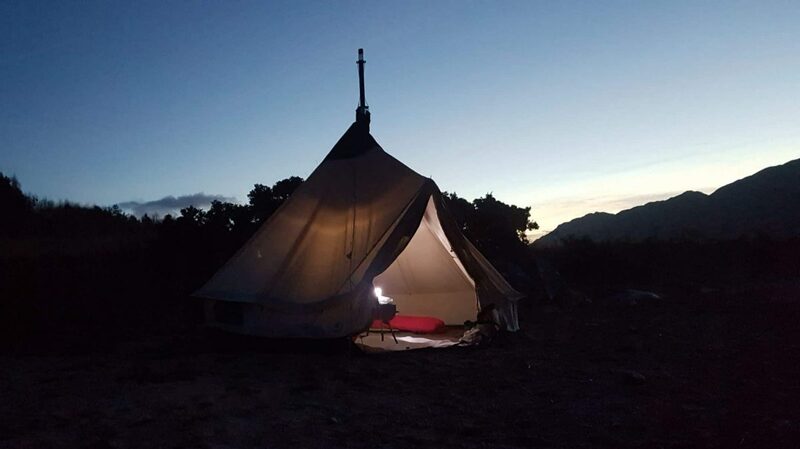 A few hours here and we called time, conscious that we’d to sort out our glamping arrangements for the night before darkness fell. We also wanted to allow time for an evening session in the middle of the loch, hoping the larger spurdog would come on the feed after dark, as they’ve done in the past. Hauling anchor we made our way back up the loch and through the narrows at Bonawe. Our target was the beach at Barrs, which offers a great camping spot. The sun had sunk below the hills behind us as we approached, but we could see shapes moving around on the sand. Too big to be human, I thought they were deer initially, before realising they were ultra-wooly and photogenic highland cows. Bugger! Deer would disappear before we landed, but cattle are a different proposition and quite likely to tangle with mooring ropes and tent guys. Assuming we could find a cowpat-free zone big enough to park the Robens in the first place. Still, we edged ashore to try and make peace with the natives. They were having none of it, and just stayed put. Given they were much bigger, there were more of them, and they had pointy horns, we decided to go for plan B. 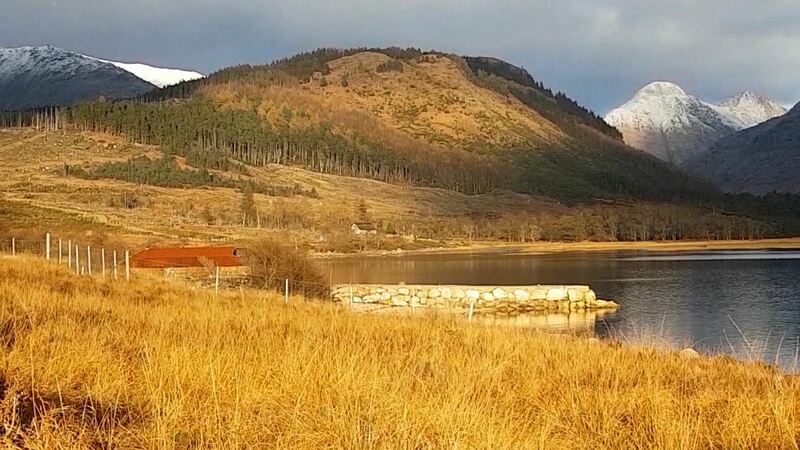 This is a more exposed mooring on the other side of the loch, and a more limited pitch space. Still, perfectly OK in the light winds forecast overnight. 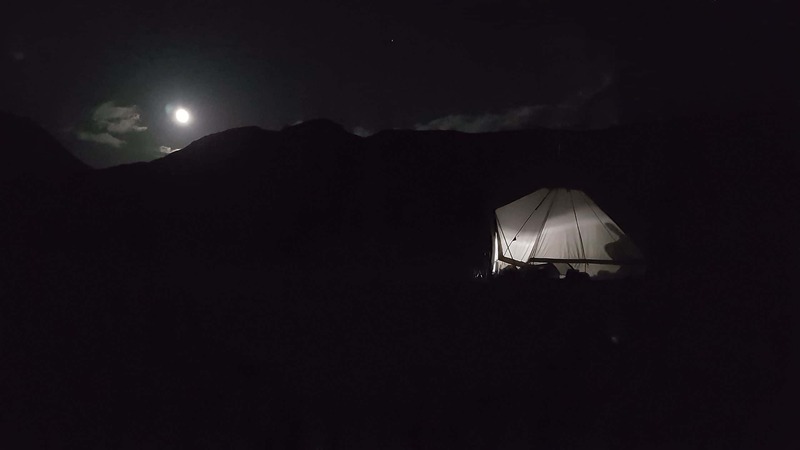 Tent erected, stove installed, and we headed out into the darkness for another two or three hours fishing. 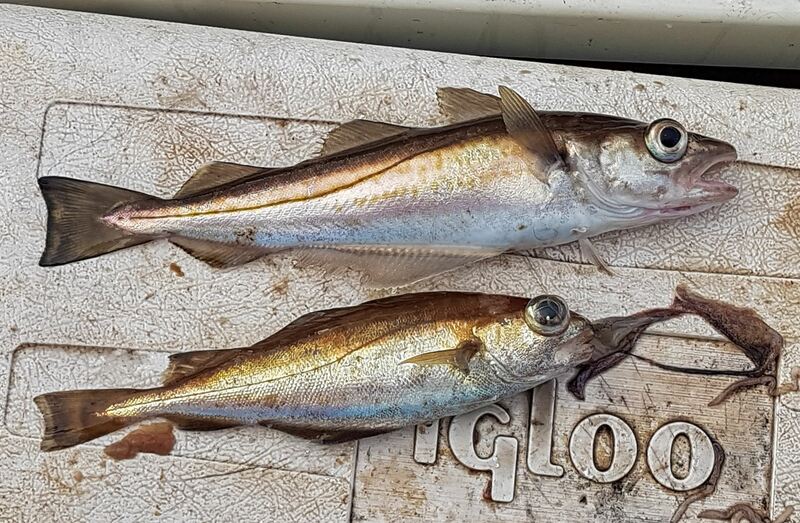 It’d be nice to say we were rewarded for persistence, but the pattern remained similar – a lot of small whiting and spurdog. 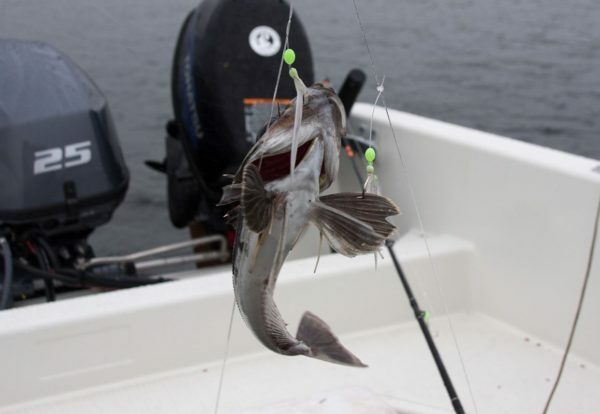 Loads in mid-water, and you didn’t need to drop right to the bottom to get action. Calm and cold, we fished on with the help of a Cup-a-Soup or two, but got nothing but tiddlers in exchange. Mainly to Ian, as I cut it back to one rod that was fished rather half-heartedly. Back ashore, and we managed to set a mooring quite efficiently, given it was completely dark, and headed for the tent. 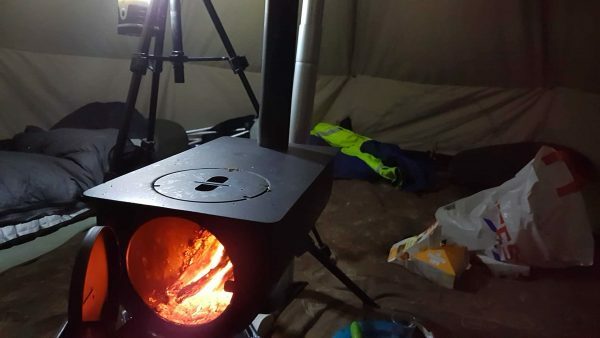 It was pretty cold, which provided the incentive needed to get the stove lit pronto. I’d taken a generous supply of wood in with us, so it wasn’t too difficult to get a decent blaze going. 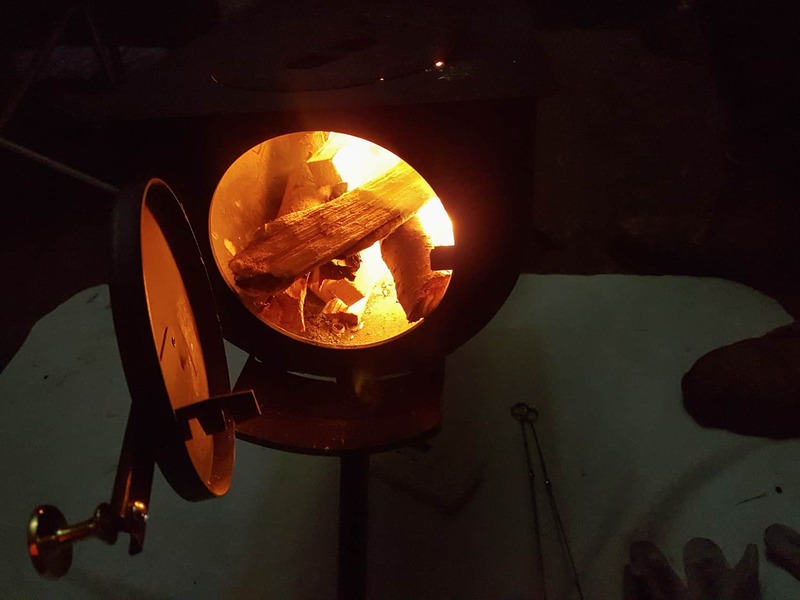 I think both of us were taken aback at how efficient the stove actually was, as it became pretty warm pretty quickly – and then positively hot. 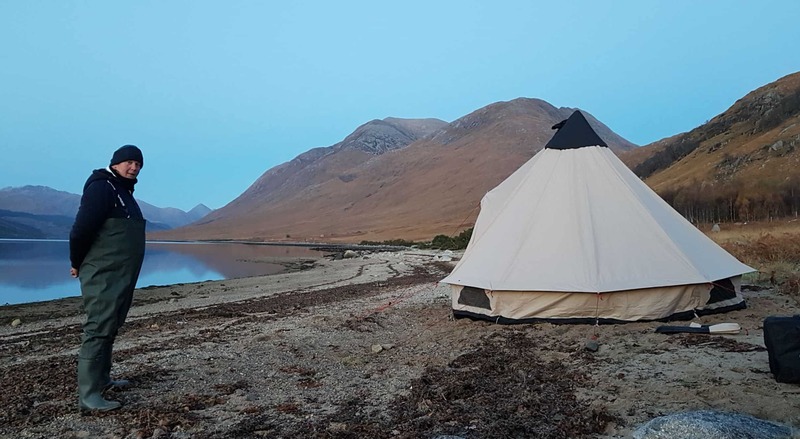 Had there been any human presence awake on Etive at three in the morning (thankfully, I’m pretty sure there wasn’t), then they’d have been treated to a curious spectacle. 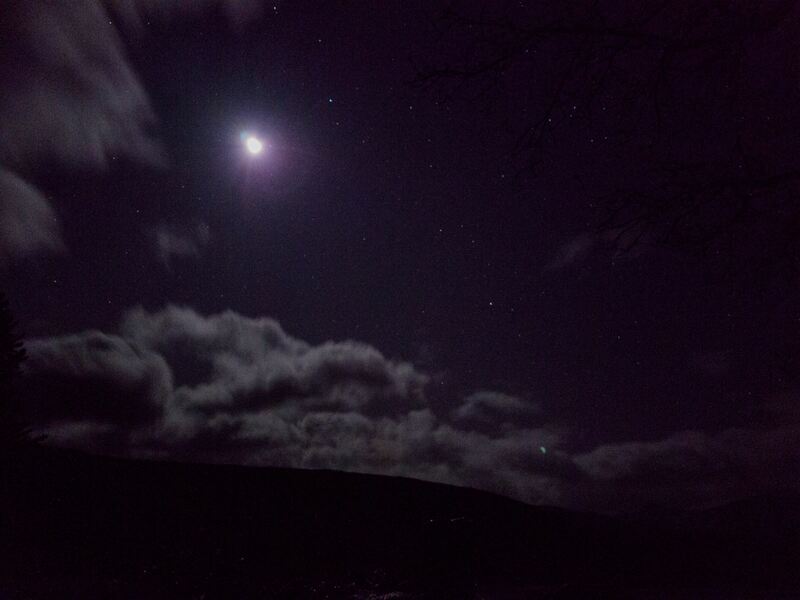 Under the light of a full moon a smallish figure, dressed only in thermal underwear and wellies was scurrying around the beach picking up rocks. We’d a leisurely start, fuelled by coffee and bacon rolls, and the sun was well up in the sky by the time we’d cleared the tent away and un-moored the longliner. Humming and hawing a bit, we decided to head a good way further down the loch and see if we could avoid the tiny spurs that seemed to fill the upper reaches. 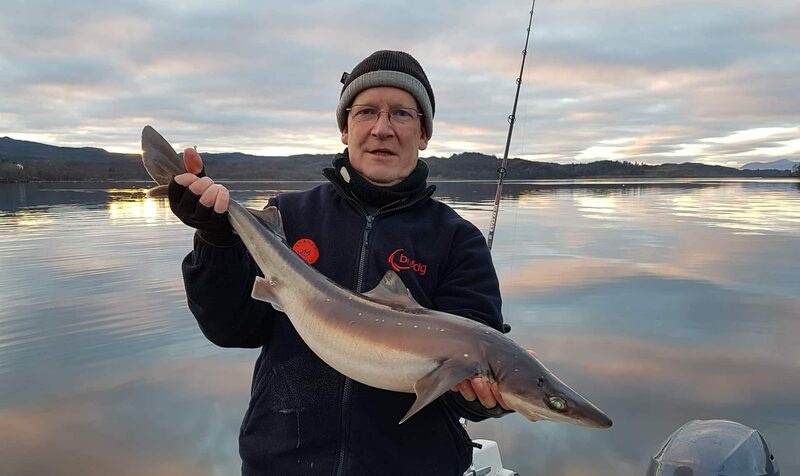 A couple of hours close inshore saw us pick up an LSD or three, plus whiting and a thornback – together with a smattering of tiny spiny critters. 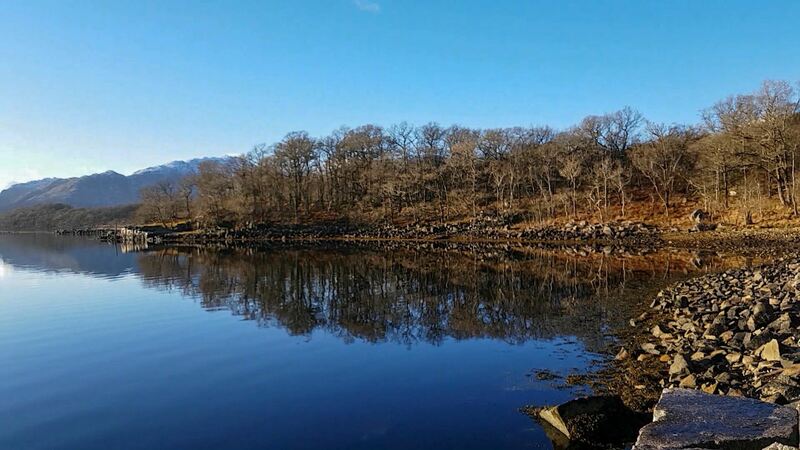 Our final throw of the dice was close to the moorings at Taynuilt, where the seabed starts to rise towards the beach. A quiet spell was followed by a flurry of thornbacks which was a bit of a morale booster. 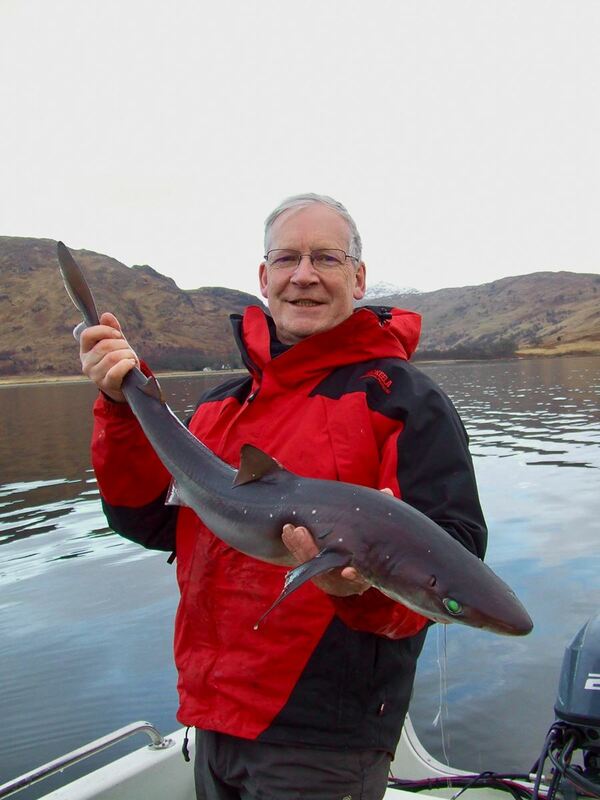 Nothing very big, but good fun in shallower water and definitely welcome after packs of miniscule spurdog. 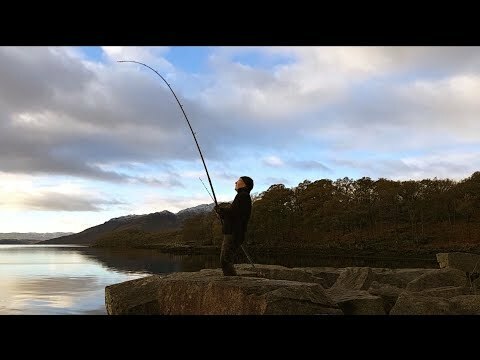 I’ve not really been shore fishing around Argyll for months, ever since the midges started to appear, so I was happy to head westwards for a daytrip at the weekend. It was 50:50 whether to trail the boat, but I plumped for the aerobic option and packed the shore gear and hiking boots instead. Plump being the operative word, as I could also do with shifting some summer over-indulgence! 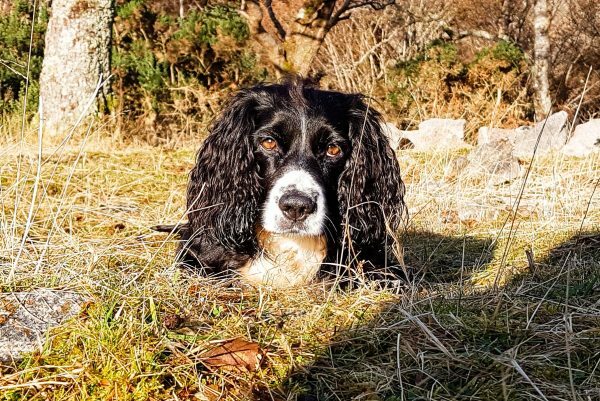 Sadly, no Bonnie dog for company, as she’s probably needing an op to repair ligament damage. On the plus side that meant I’d actually get some fishing time, as opposed to spending my day chucking sticks for her. Autumn was starting to show some teeth as I headed west, with sub-zero temperatures showing in several places. The early morning sun soon beat back any hint of frost, but it’s a reminder that winter isn’t too far away now. At least the summer crowds have largely gone, although the car park at the head of the loch seemed well enough occupied for early on a Saturday morning. 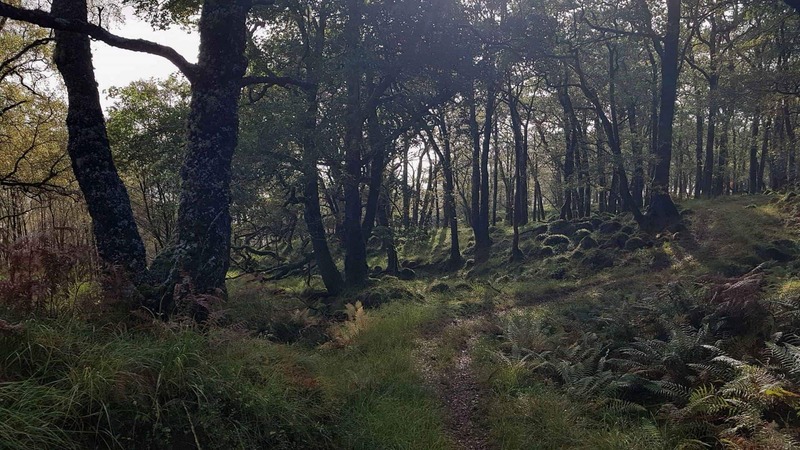 The walk along the loch was knock-out stuff this morning – and I don’t just mean the struggle through bog and overgrown, saturated vegetation. Even the mist was dramatic, and the landscape revealed as the sun broke through was west highland picture perfect material. The hike is definitely hard work, but very rewarding in fine weather. 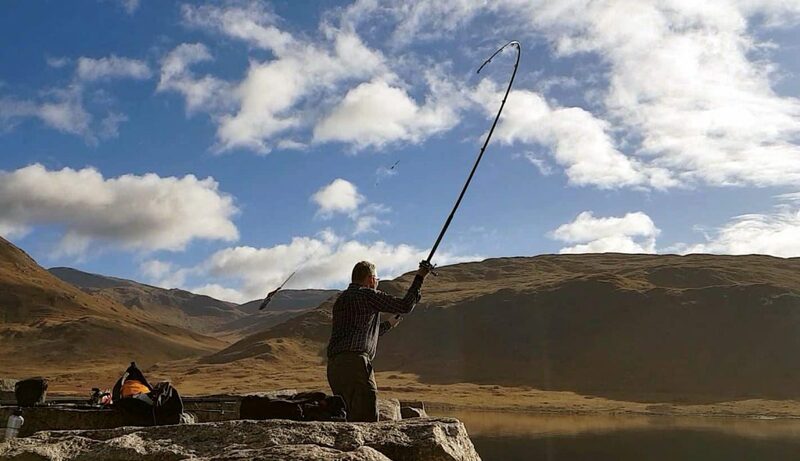 Late morning had me setting up the rods with mackerel baited pulley rigs and casting out into calm, deep, water. The tide was ebbing, which makes life easier on this mark, and the sun was shining. 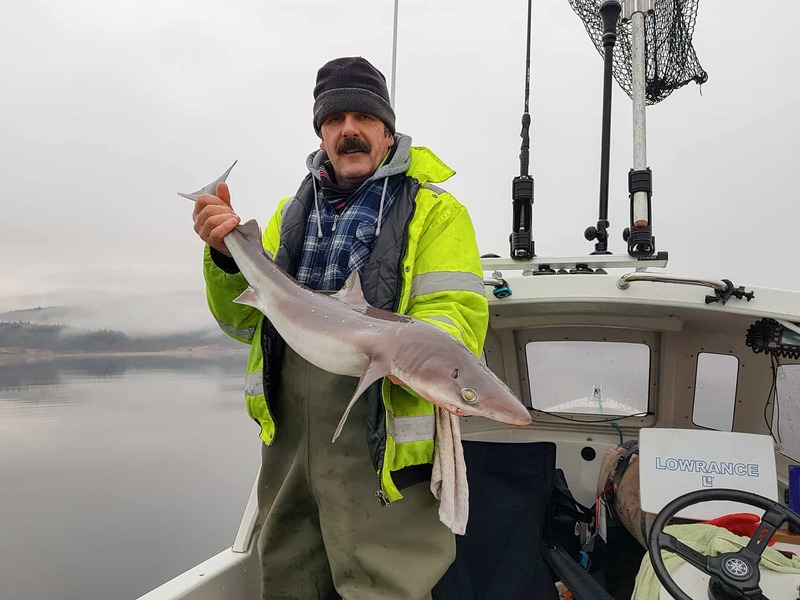 However the fish didn’t seem as inspired as I was, and it was almost an hour before the first bite translated into a small spurdog. It was quickly returned, just as another pair of anglers hove into view, and set up at a nearby mark. A few fish later I headed round for a chat and to see how they were doing, as I’d not fished the spot they were on. Turns out that they started off before me, but had overshot the turnoff from the trail and then spent quite a while making their way to the marks. I consoled them a little by telling them that Trevor and I had a pretty hard time finding our way here the first time we tried. 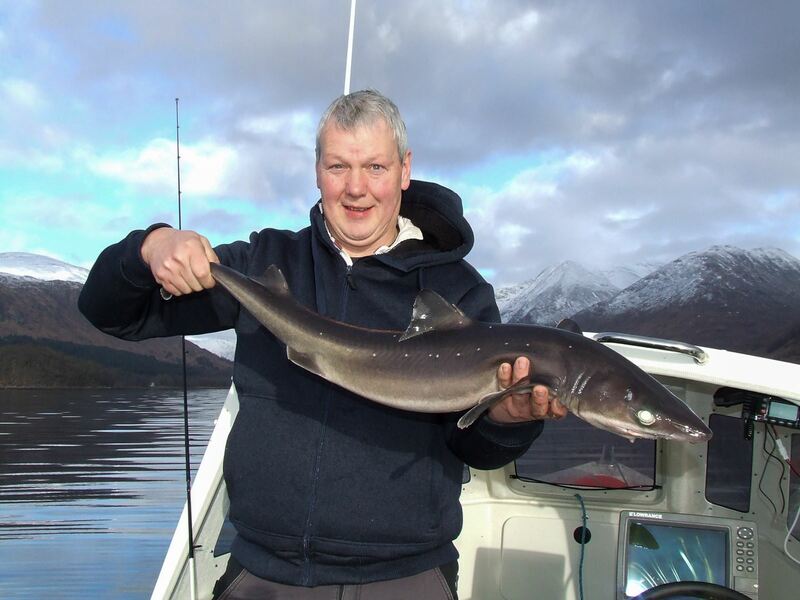 At least they were also catching fish as a reward for any blisters incurred. 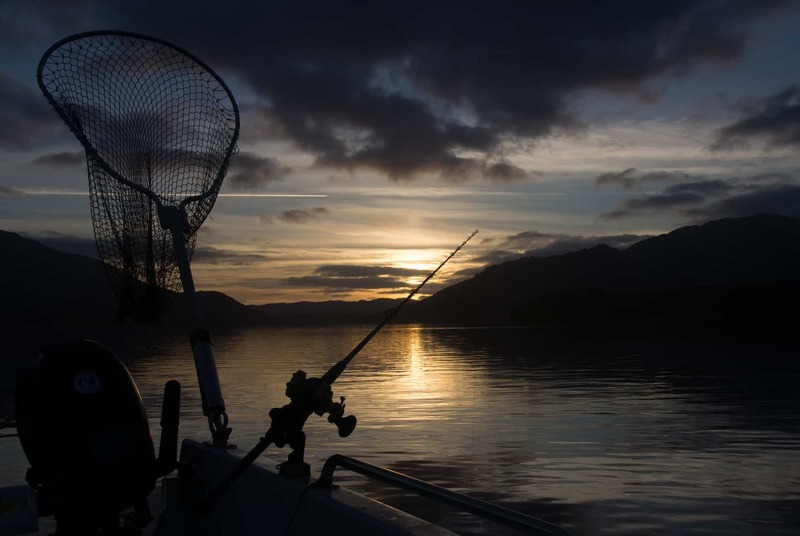 The day rolled on nicely – more fish, more coffee and more bacon. A good bit of sun, some breezy spells, and a shower or two. Basically, easily enough to keep me occupied for the rest of the afternoon until I decided to head for home before sundown. It always feels longer on the way back, but nothing felt too broken by the time I arrived at the car. In day trip terms this is very much an even split between hiking and fishing and that’s part of the attraction to me. 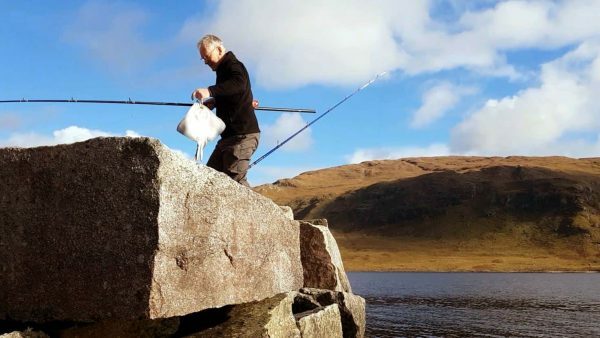 I like my hiking and I like my fishing, and this combines the two quite nicely. Add in a little hillbilly cooking and it suits me perfectly. Ah well, I’ve not been completely inert over the past few weeks, although there has been little real drama to report. A few upgrades to the boat, adding a bait board and a cabin top rack mount for spare rods and cameras, etc. Railblaza is nice kit, but eye-wateringly pricey! 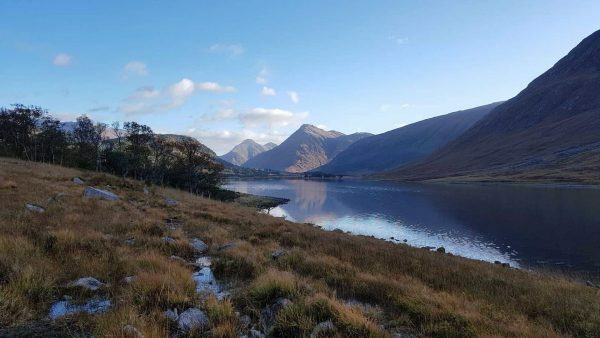 I’d an overnight trip to Etive last month where a fairly wet evening transformed into a lovely sunny morning. 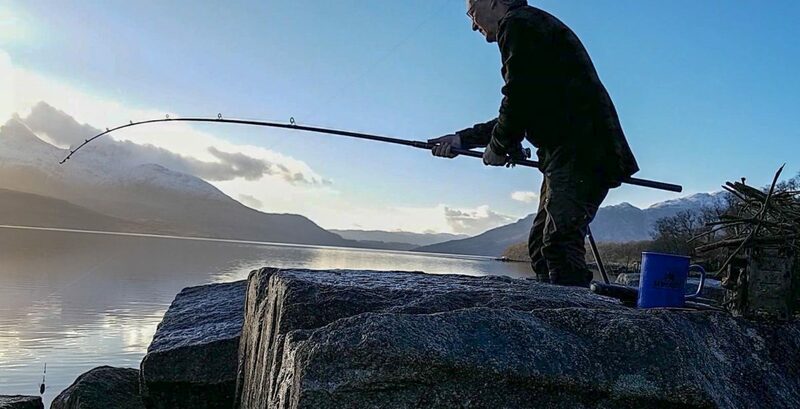 I’d a couple of 90 minute sessions with the rods but spent more time fossicking about the shoreline and checking out a couple of alternative camping spots for future reference. I might’ve spent more time fishing if there weren’t hordes of tiddler spurdog shredding baits within seconds of them nearing the seabed. Most maybe 15 inches long, and nothing above 3.4 to 4lbs. A couple of whiting also showed up, but when the seabed is carpeted with little spurs it becomes a waste of time really. 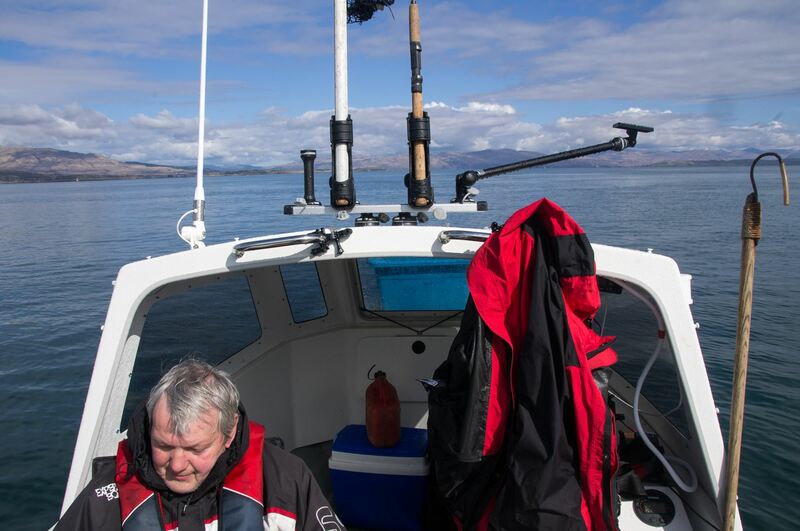 More recently, Ian and I were out of Oban catching a mild roasting in the sun and little else. 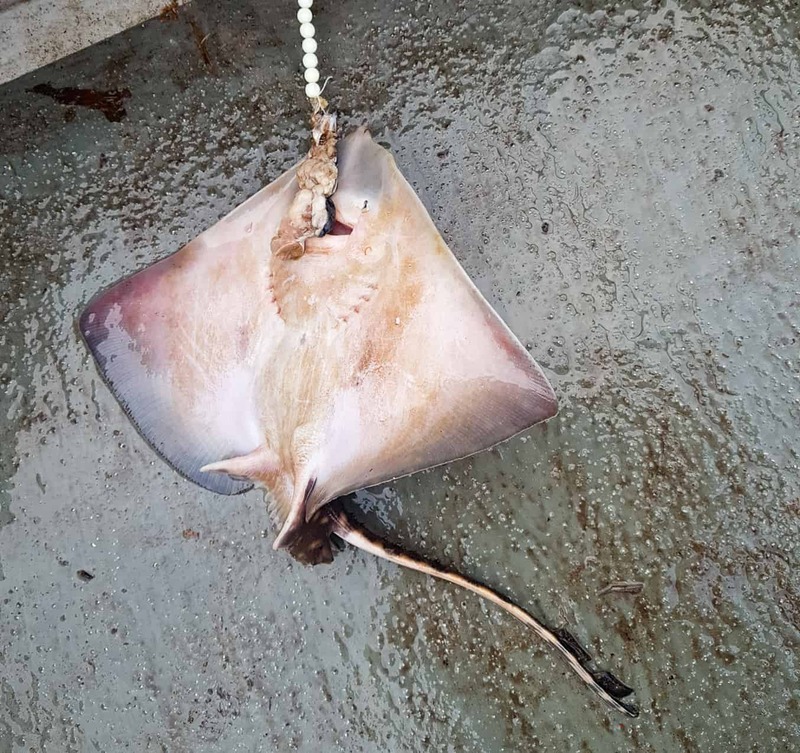 I landed the only fish of the day, a male skate of around 120lbs, and we both contrived to lose another. 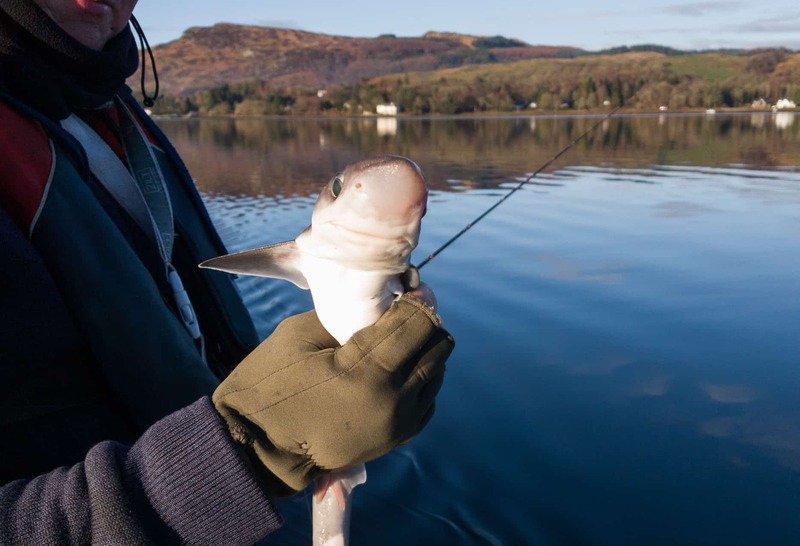 At least it was a nice day, but a bit disappointing compared to our average catch over the last couple of years. And I’ve done a little upgrade to my fishing accommodation with this little glamping setup – beds, stove and standing headroom, what more could you ask for! 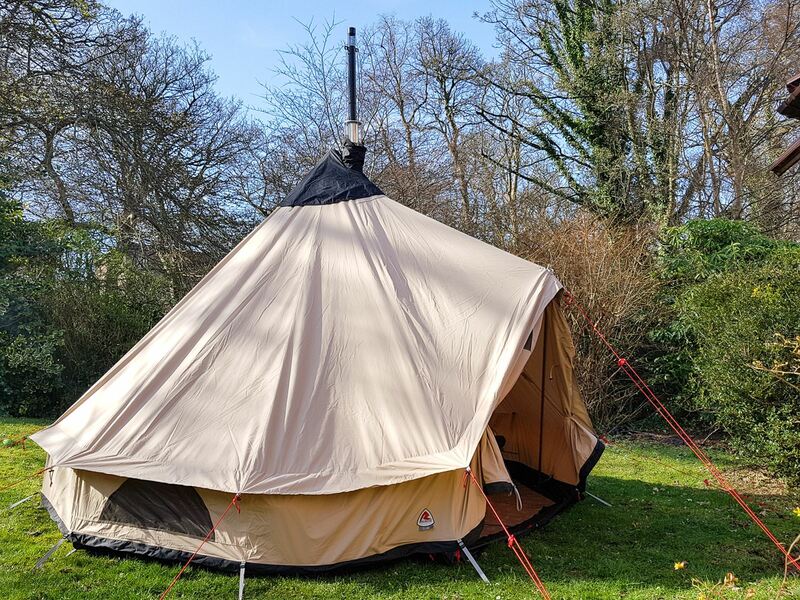 It’s not exactly portable but will work OK as a base camp, and double up for an occasional family weekend too. After a couple of weeks of cold, windy and snowy weather I really welcomed the prospect of a calm, sunny day on Friday. 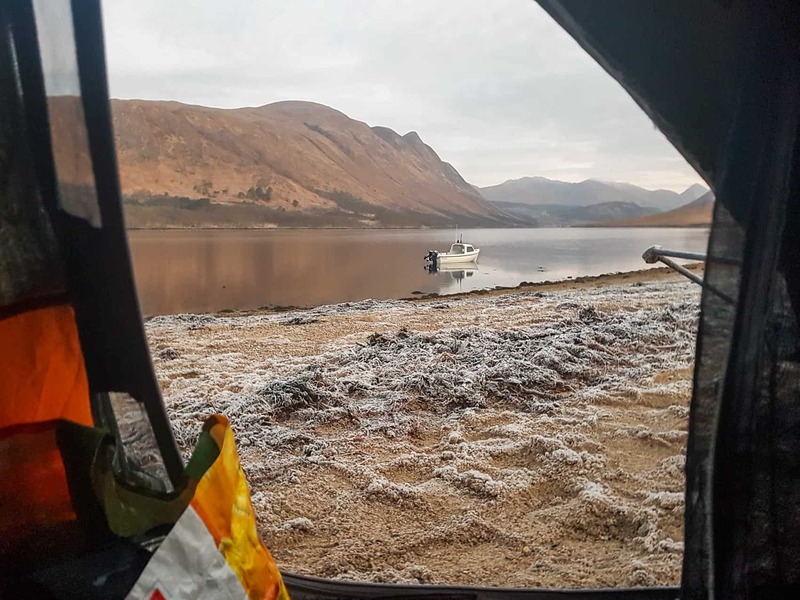 Ian was up for the challenge of an early morning start, so high water saw us slipping the dinghy into the cold waters of Loch Etive around half-eight. 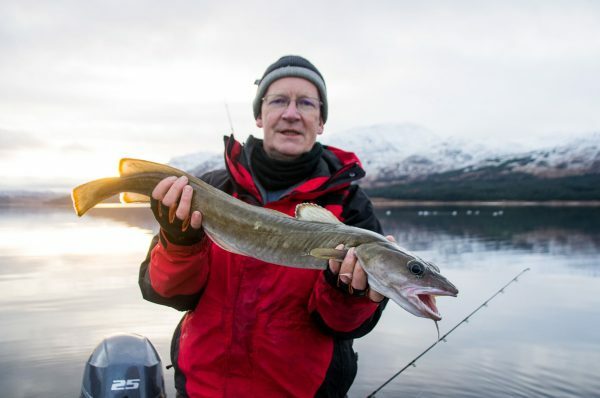 I followed my usual habit of fishing a spot or two down the loch on the ebb tide and we got what has become the usual result – very little. Only 3 or 4 whiting in fact, which suggests I need to revamp tactics a little. Or perhaps building the new fish farm nearby has disrupted things a bit? Reversing course well up the loch put us into more fish friendly territory. Micro-spurs to be more precise 🙁 I don’t know which is worse – catching nothing, or hauling tiddlers 250+ feet. 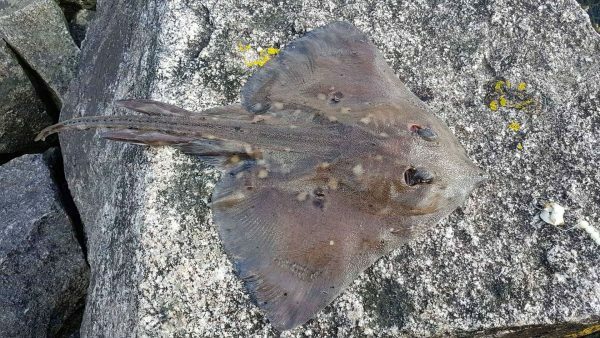 We were kept busy hauling them to the surface and soon shed our jackets as we started overheating in the sunshine. 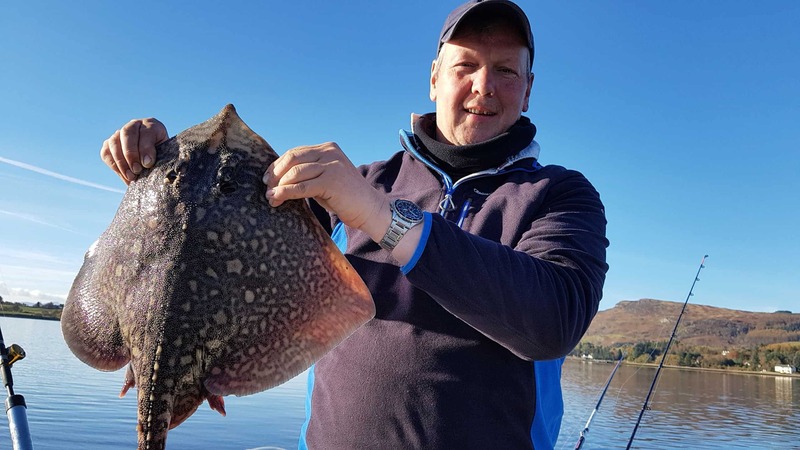 Happily things started to improve and a handful of better fish appeared. Ian provided this nice fish of just over 9lbs and I added another not long afterwards. A sprinkling of whiting and a suicidal poorcod mixed it with the spurs and Ian did his usual efforts to clear any LSDs from the vicinity. I think he managed 8 to my 1! 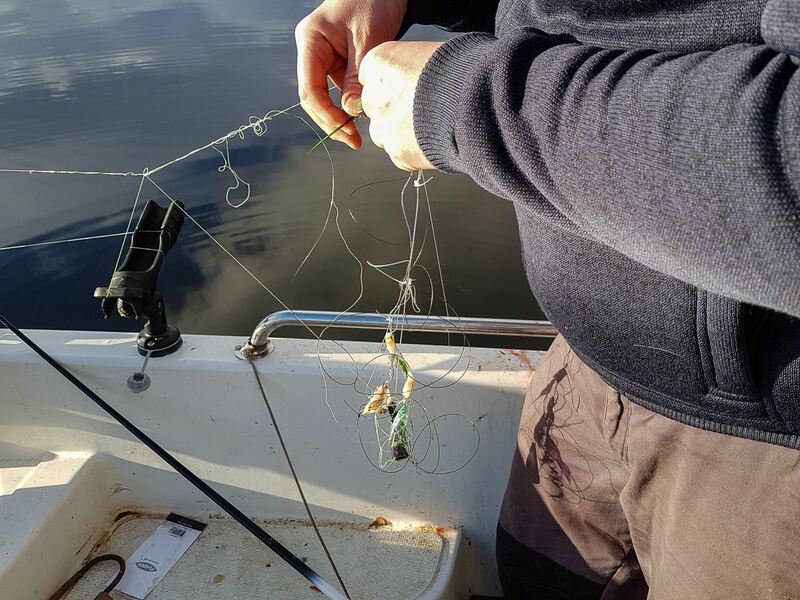 Tangles – the less glamorous side of fishing! 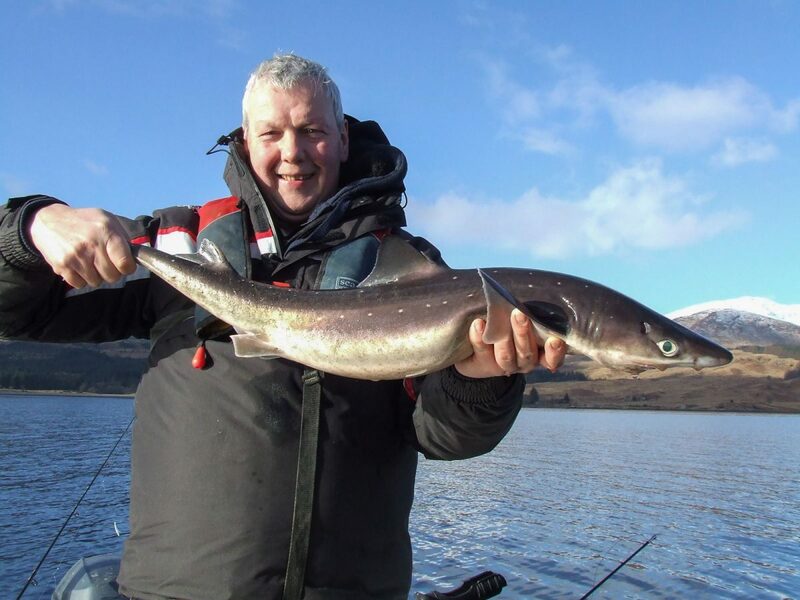 A couple more spurs around 9lbs came along as we basked in the sunshine and munched a bacon roll or two. 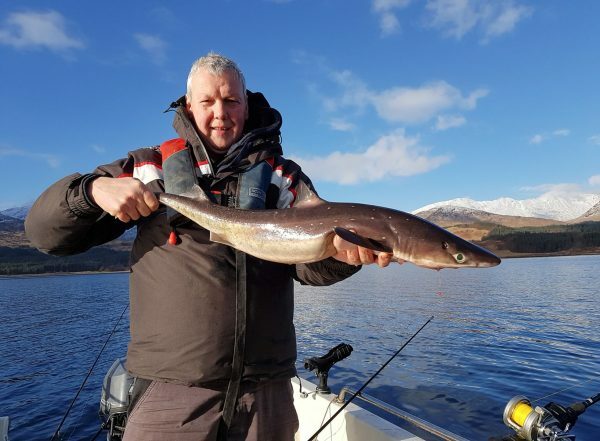 Not exactly fantastic fishing but a lovely day to be afloat in midwinter! Our final tally was around 50 spurdog (the vast majority very small), perhaps 10-12 whiting, 9 LSDs, and one each of thornback, codling and poorcod. 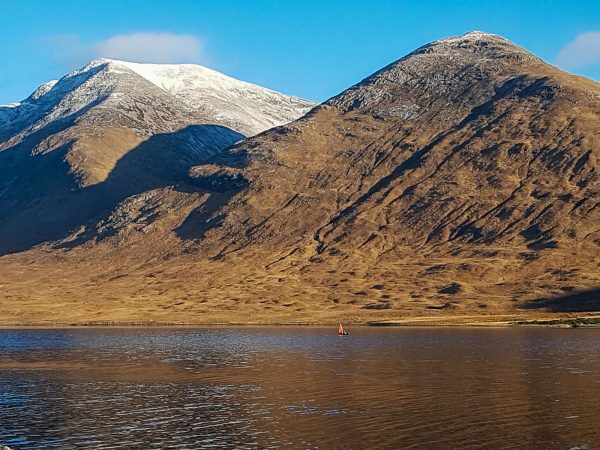 Days of Christmas force feeding meant I really needed to get some fresh air, so I reckoned a hike in the sunshine along the banks of Loch Etive would fit the bill nicely. 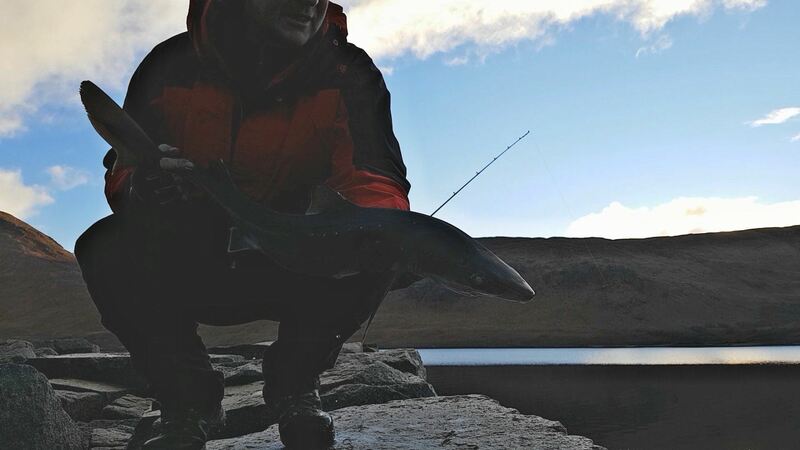 Fishing wasn’t the main aim but it looked possible to get 3 or 4 hours to wet a line before darkness fell. Bonnie, my bozo spaniel, came along for the day and quite happily trailblazed as we trudged along. Happily, the cold had frozen most of the water into the ground so it was less boggy than a month ago and we made steady progress towards our mark. 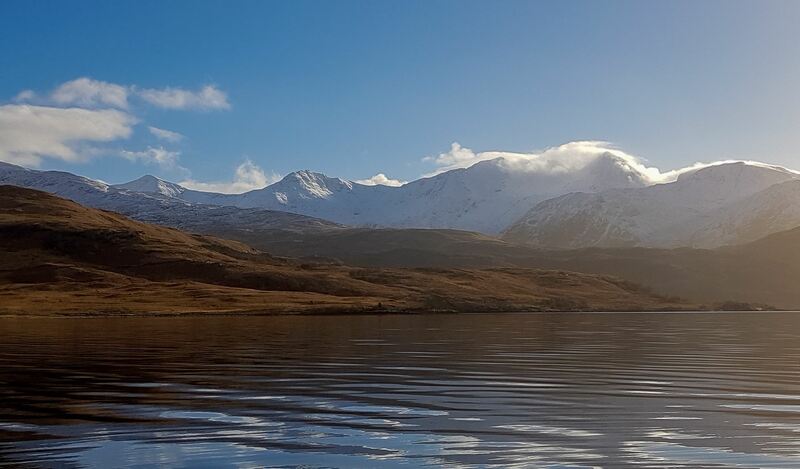 With the sun still hiding behind the mountains it was chilly but otherwise a beautiful day to be out. Arriving at our mark I quickly rigged up and cast out whilst Bonnie waited impatiently for sticks to be thrown. Unluckily for her there was a solid stream of distractions in the form of small male spurdogs and I was kept busy dealing with them. On two or three occasions I got bites just as soon as I hit bottom, suggesting there were large numbers about. 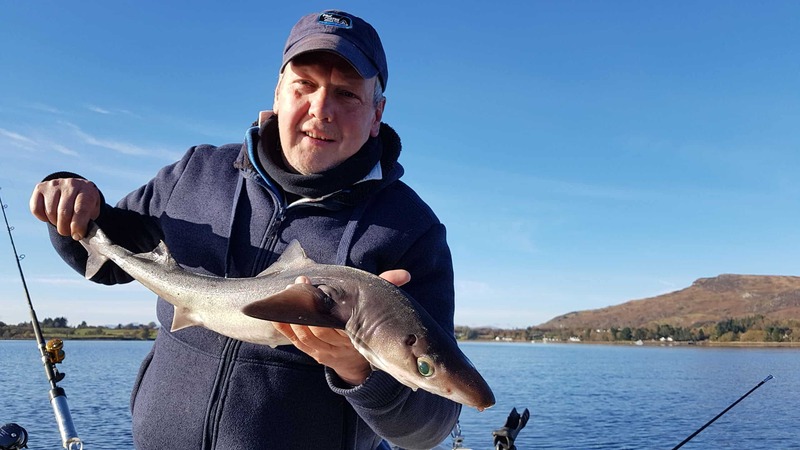 With only a short session and quite a lot of action between the fish and doggie stick chucking, it took a while to get a brew on – but I can’t survive without a supply of coffee. 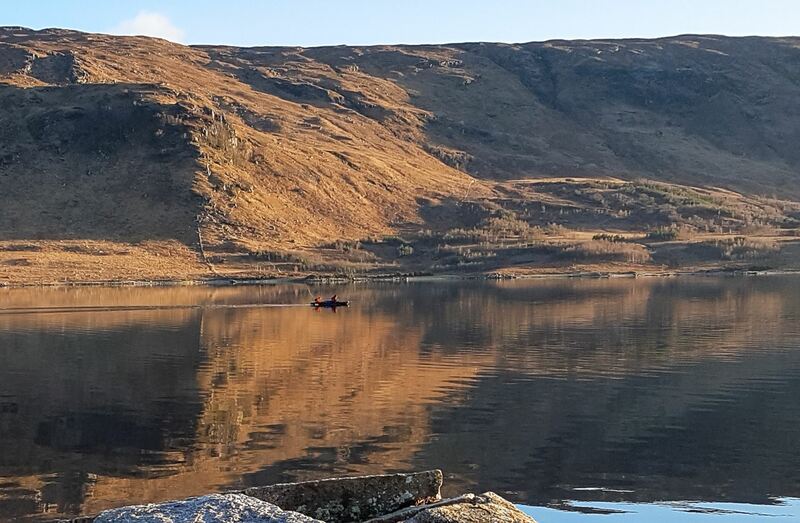 This time I wasn’t the only one out on the loch. I’d passed a tent with a couple of shore rods parked outside it on the way in, and there was a kayaker out as well. 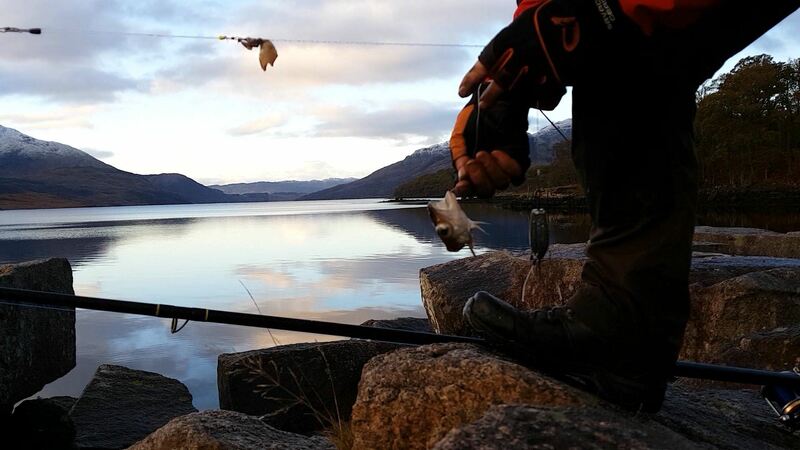 Plenty loch to go around though! 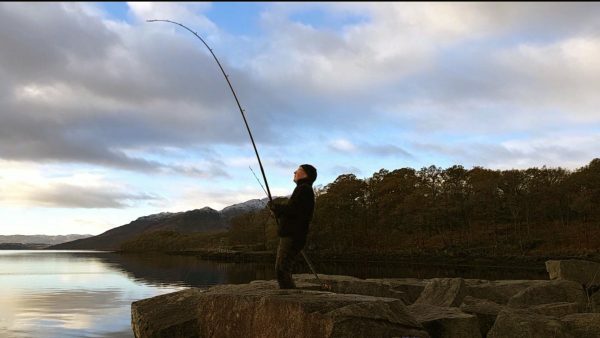 I chucked in the fishing around 2.30, to be sure of making it back before it got too dark. A final tally of 15 spurs and a couple of dogfish for 4 hours fishing was a good bit better than I’d expected, even if none of them made more than 3lbs or so. The return trip to the car was a fine walk as the sun faded and turned the mountains golden, all reflected in the perfectly still waters of the loch. Our timing was good and we crunched across the carpark just as the last of the light disappeared. I do like this time of year – the nights are long but it’s not too cold, and the worst of the bugs are back in hibernation. 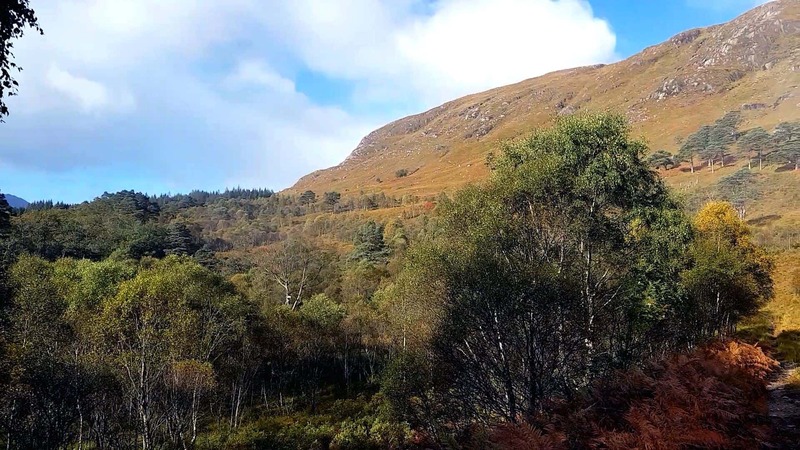 The autumn colours are still around and the summer crowds have largely gone. And last weekend the weather and the tides lined up nicely too, so I sorted out my tent and loaded up the rucksac again. Time for another wild camp on Etive, fishing right alongside my tent in a very quiet spot where deer were the only likely intruders. To me the long walk in is part of the attraction of this mark. The track is rough and quite arduous in places, but it runs through wonderful scenery and quite splendid isolation – a very rare commodity, even in Scotland. Travelling light is a relative term, but everything goes in the rucksac apart from the rods themselves, and I keep gear to a reasonable minimum. This time I was relying on a campfire for cooking and hot coffee, so the gas stove was swapped in favour of a little fatwood and a couple of mini-firelighters. A few leads, traces and a little coolbag with mackerel bait was pretty much all I needed to fish, as the loch doesn’t tend to be too tackle-hungry. A couple of hours later I arrived at my destination, having worked up a decent sweat in the process with only a single tumble into the peat bog on the way in. 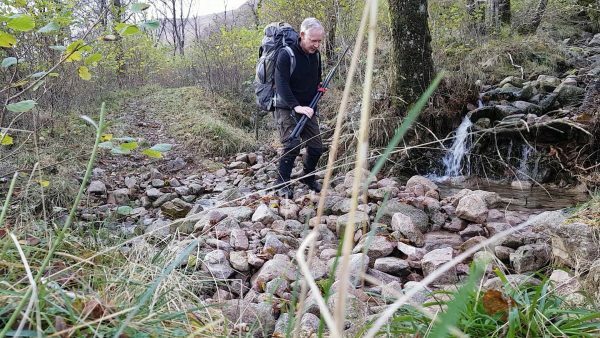 Mild embarrassment and a wet fleece were the only casualties, but a reminder of the reason I carry a PLB on these trips – the line between merely looking silly and potentially crippling injury is a fine one, and easily crossed over. 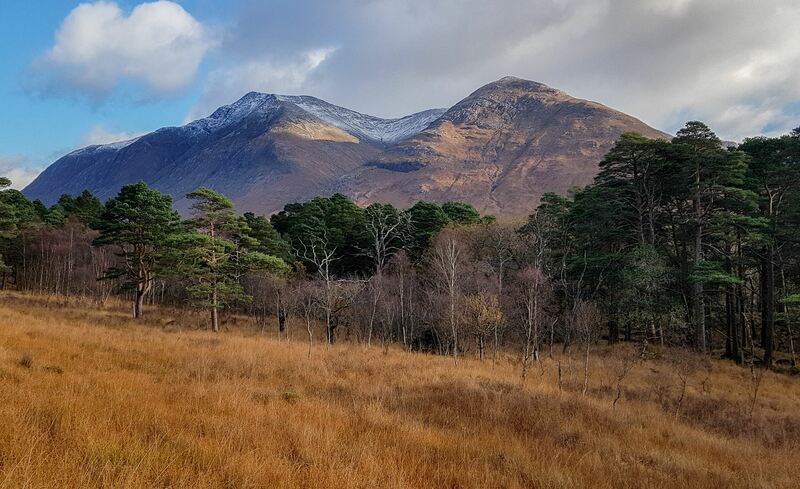 Scots Pine with Ben Starav in the background. Set up, bait up and cast in – it doesn’t take long to get fishing on this mark. 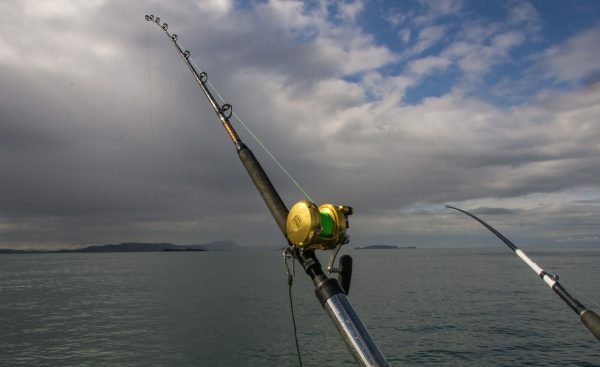 I am pretty lazy when it comes to fishing here, and I don’t tend to spin or float fish for the pollack which also swim around here. However I did need to sort out my campsite for the night, and darkness comes early in these parts at this time of year. 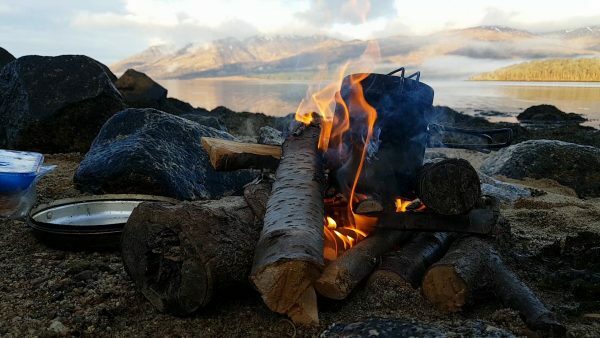 My “semi-detached” style of fishing allowed me time to get on with collected kindling and firewood, and to set up the tent. Finding dry wood can be a bit of a challenge on the west coast, as anything on the ground gets saturated quite quickly, so I’d to tramp around a bit to find decent chunks of dead but still standing timber. My efforts were rewarded by a couple of nice pieces of oak to form the core of the fire, and a good bunch of dry-ish bracken to act as tinder. 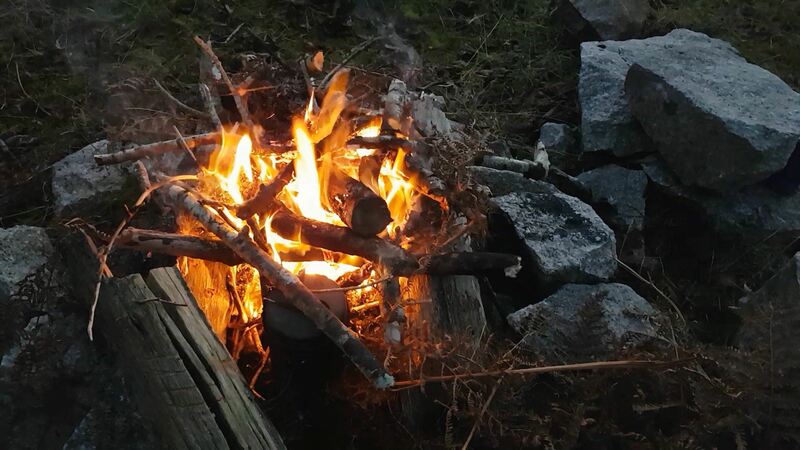 Happily it didn’t take too long to get a decent fire set up and burning steadily. 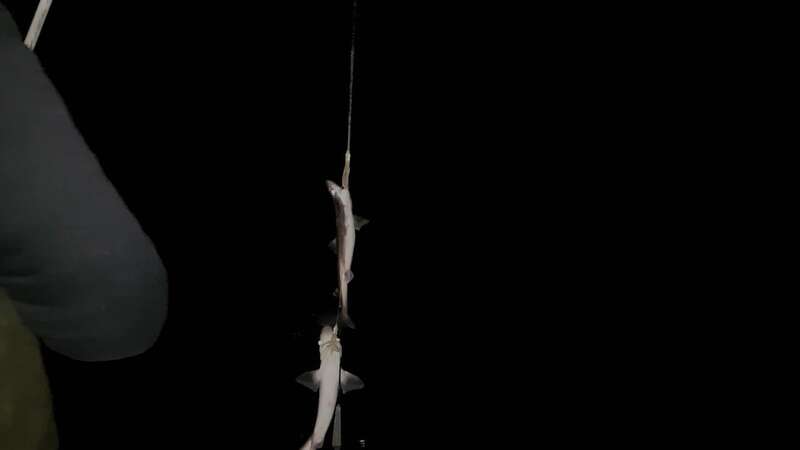 Almost in parallel, there was a steady run of spurdogs taking my baits. 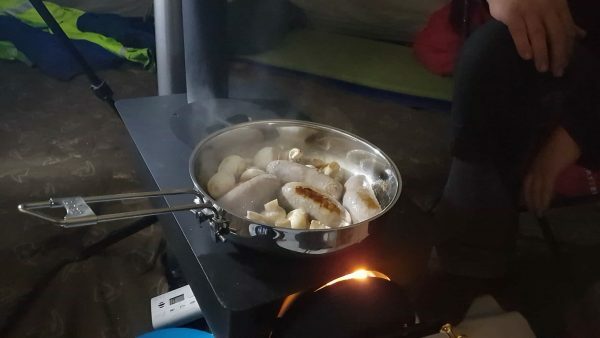 I missed a few due to my fire raising, but the body count was respectable and rising as I put the coffee pot on to boil and tucked a couple of potatoes into the fire to cook away. 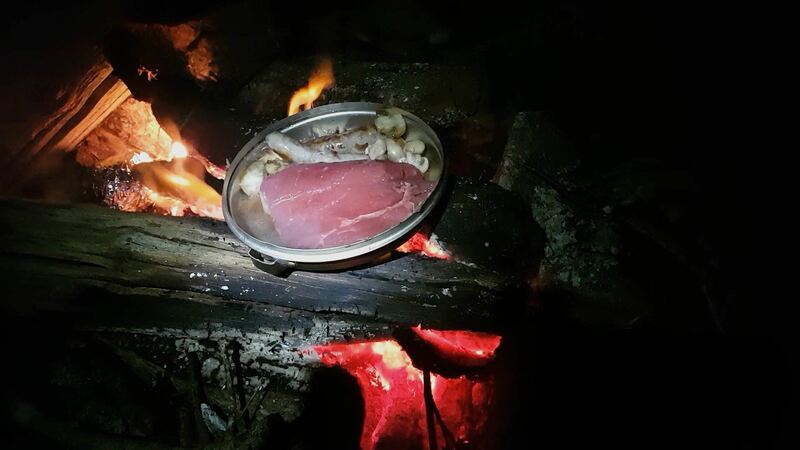 The light finally faded as I returned my one and only thornback ray of the trip, and the steak and mushrooms went on to cook – I felt I deserved a little treat for braving a long November night. All fairly primitive, but I dined well and in very contented fashion as I contemplated the stars reflecting in the calm waters of the loch. Not a light or trace of humanity disturbed the quiet. Steak and mushrooms. Treat and a half! I’ve not had a baked apple since I was a kid, but it was a perfect follow on to the steak. Apertifs came from a slug of Talisker and then it was time for an early night. 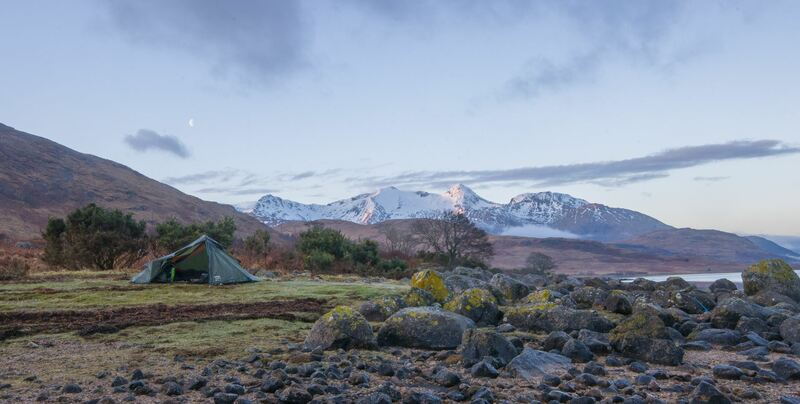 Next morning dawned clear and cold, with the sky clearing after the last shower departed, so I struggled free of my warm cocoon and back into thermals. The gear was pretty much ready to go so it was a matter of minutes to bait up and cast out. 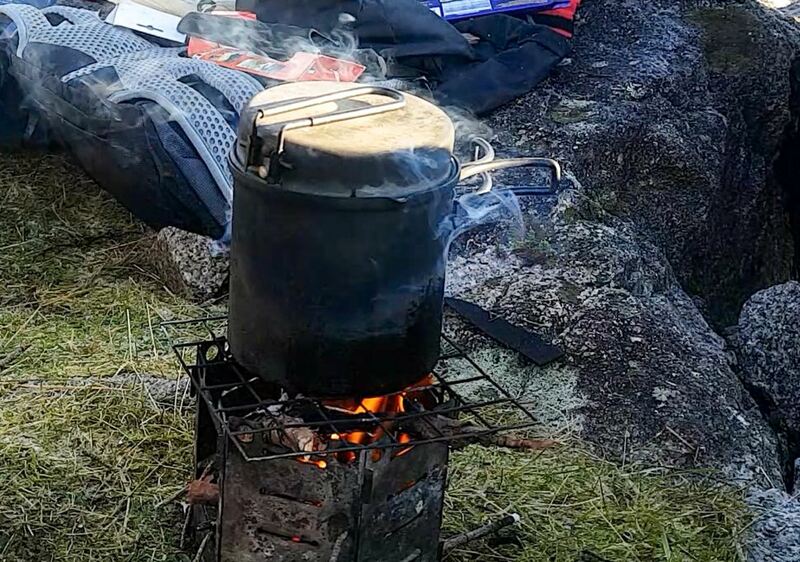 Then back to trying to re-awaken the campfire and get some breakfast on the go. 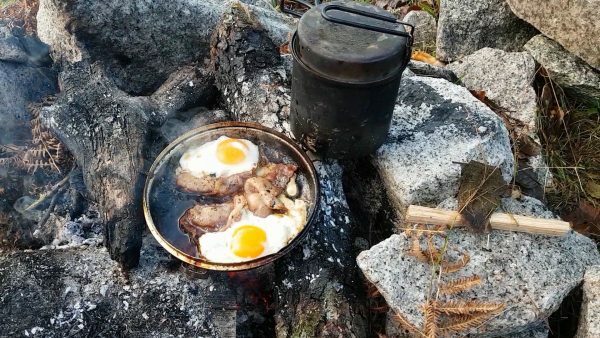 My backup was in the form of muesli, so there was a strong incentive to get the fire going and polish off an early morning smorgasborg of sausage, bacon, mushrooms and eggs. The overnight rain dampened everything enough to give some anxious moments, but I eventually kickstarted the fire and breakfast got underway. Just like the campfire, fish were a little slow to come out to play, but started to appear just as breakfast got to the critical stage of pre-burn perfection. A little careful juggling kept everything edible whilst still pulling in a few more spurdog and a rather more grisly whiting head – its body presumably forming the equivalent of spurdog bacon and eggs. Over the next couple of hours I had a coffee or two, pulled in a spurrie or three, and generally organised my backpack until, rather slowly and reluctantly, I packed up camp and prepared to move back down the track towards civilisation. I wanted to fish a mark about half-way back to the car that I hadn’t tried for 2 or 3 years. Whilst I fully expected to repeat previous experience and find it stuffed full of micro-spurs in the sub-12 inch category, I felt it was worth a shot, just to see. My expectations were fulfilled, and faint hopes dashed, as a succession of micro-spurs dutifully gobbled up the bait and were dragged ashore. An hour of this was more than enough, especially given a blustery northerly wind, so I was soon heading back towards the car. Given it’s a fine spot to camp and fish it’s a shame that there don’t appear to be any larger fish around here. 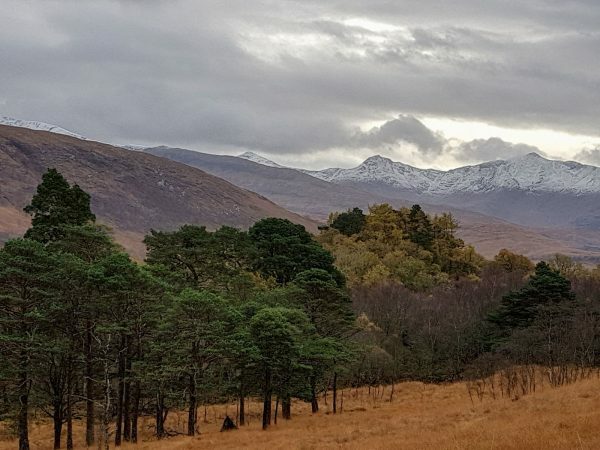 A final splosh through the sodden moorland saw me back at the carpark at Glen Etive, with a couple of final treats in store on the road home. 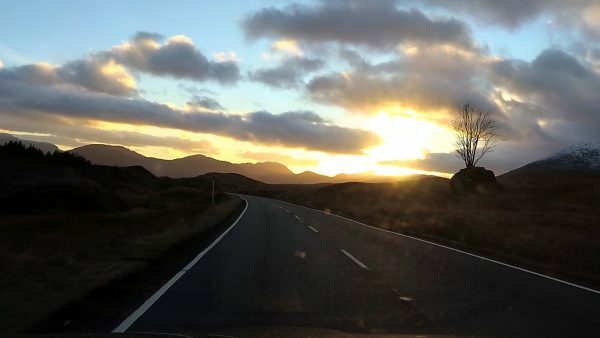 The first in the shape of large numbers of deer (there are loads in Glen Etive), and then a very fine sunset as I crossed over Rannoch Moor on the way back east. A reminder that Scotland can be magnificent at times, and not just a prisoner of Atlantic weather systems… Definitely an A-list weekend! I’ve recently said goodbye to Alcatraz, my faithful Warrior 165. 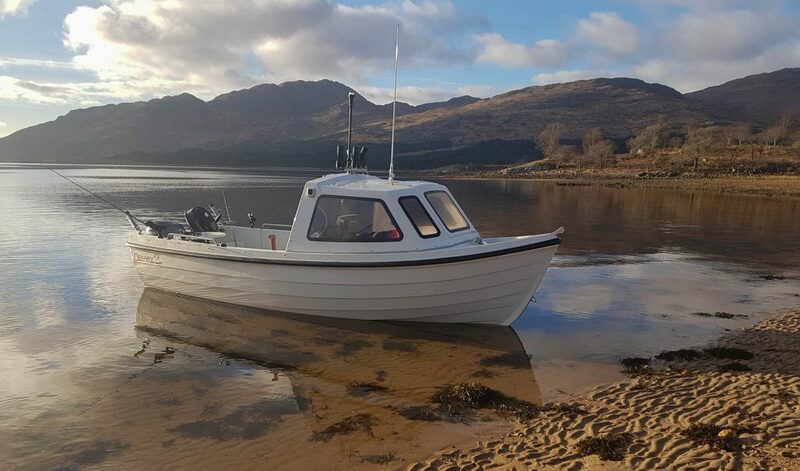 She is now 10 years old and not getting quite the same use she once was, so I’ve been rethinking what I need from a boat for the next few years. Consequently, and after a lot of soul searching, I’ve just taken delivery of an Orkney Longliner2. 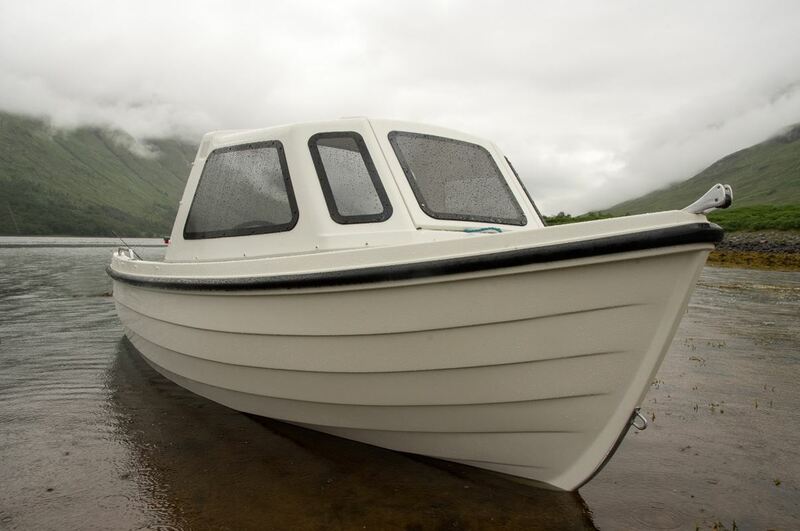 The Warrior is an excellent boat but it’s a little big and heavy for what I need nowadays. I reckon I can get more or less everything I need in a slightly smaller and lighter package. 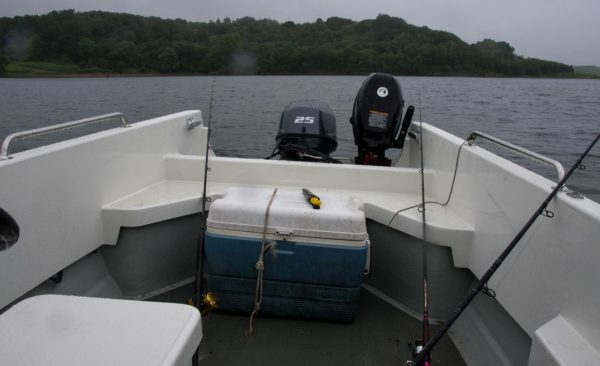 I still want to fish easily with two aboard, although three is a rarity for me. Whilst I avoid boat fishing in windy weather I still want a very seaworthy dinghy capable of handling poor conditions. 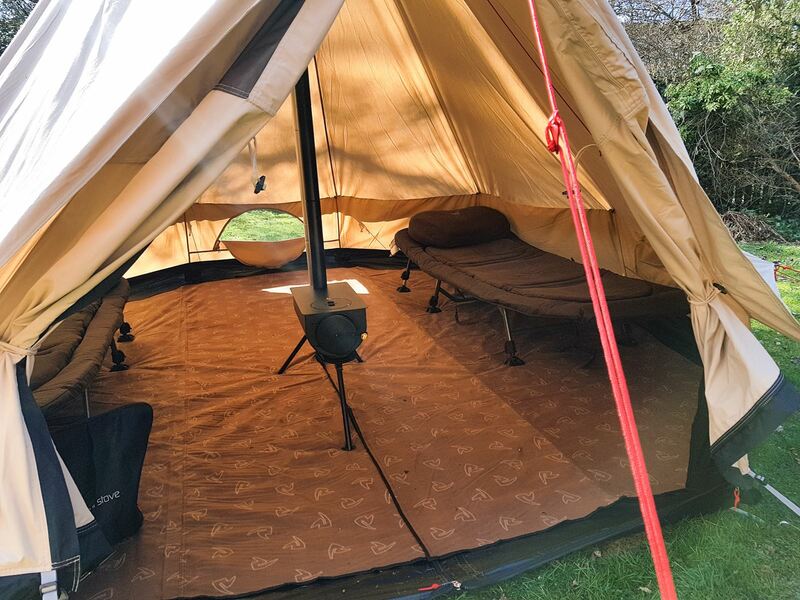 The Longliner 2 will live at home and under cover, which means it can be loaded and pretty much ready to go at any time. 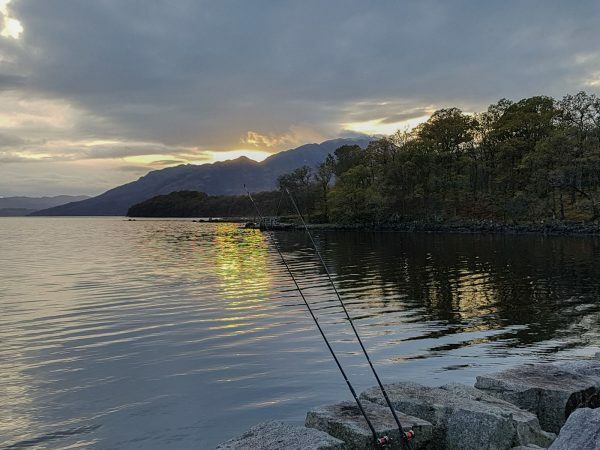 A lot of my fishing is short notice, following the weather type stuff, so the extra flexibility is important and should encourage me to get out fishing more often. Dodging the cost of a boat park space is a welcome bonus too. A biggie for me is that I get away from the horrors of a braked trailer and high levels of maintenance they demand. This is a really big plus point, as keeping a boat trailer legal is a major hassle if you’re not particularly mechanically minded. 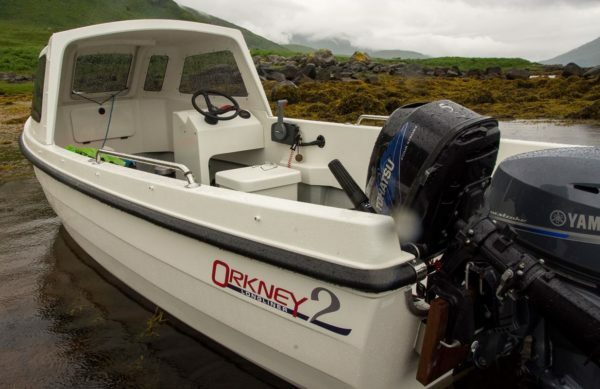 The Orkney is definitely a slower boat but I’m no speed merchant and the practical difference over a typical 5-10 mile run is pretty minor, especially as sea conditions around Scotland rarely allow WOT running anyway. Orkney claim 22 knots (25mph) top speed but I doubt I’ll see that, and something in the 16-18 knot range works fine for me. 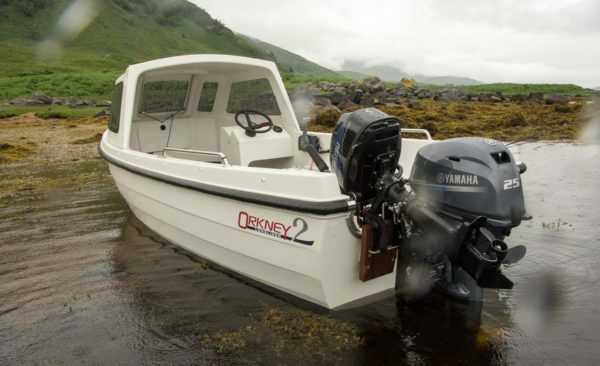 The LL2 is apparently an updated version of the older Orkney 520 hull and certainly isn’t directly descended from the original Longliner. 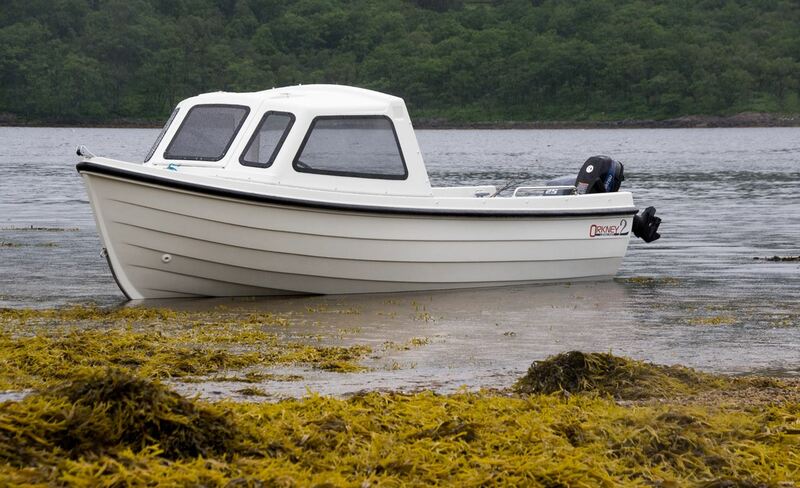 So it’s a lot faster than the longliner and can take a larger outboard, although the max is 25hp. It’s max quoted speed is 22 knots compared to 30+ from the Warrior, although I rarely took the 165 much above 22-23 knots in practice. I trailer a boat thousands of miles a year. Braked trailers are a complete and utter pain to keep legal, so a move back to unbraked trailing is very appealing. 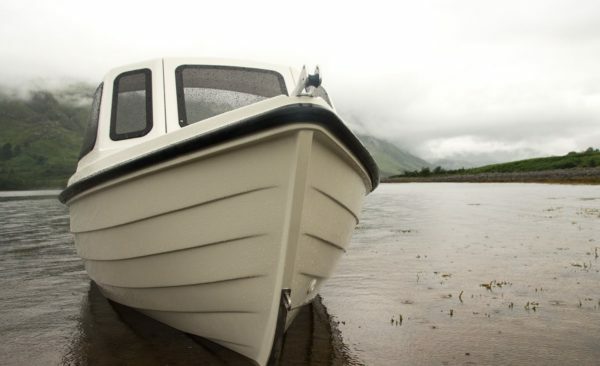 A lighter boat is also easier to tow, although the Warrior is hardly difficult to move about, or launch, single handed. The LL2 will pretty much live at home, rather than in a compound miles away. This obviously saves a few bob, but the big benefit is that it makes it easier to drop everything and go fishing at short notice. I’ve noticed that I was using the Warrior less than I should simply because of the hassle of picking her up and putting her back in her compound. 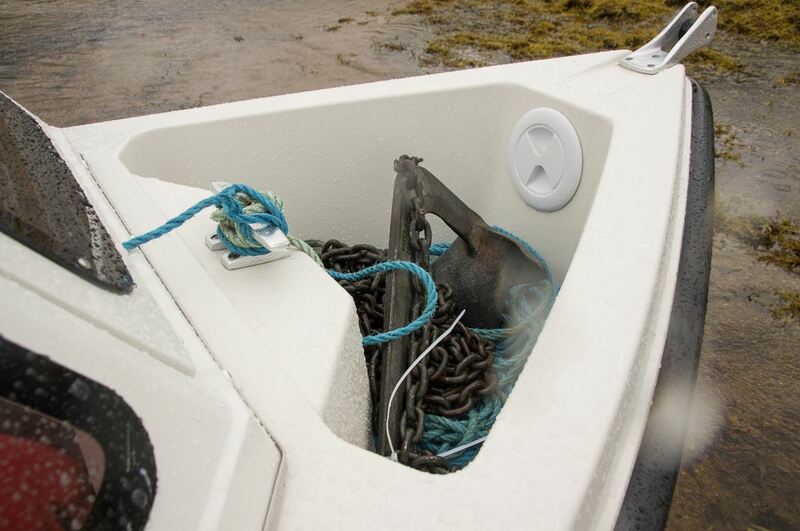 Being under cover and close at hand both reduces maintenance and makes it easier, as well as allowing her to be kept in fishing ready condition with gear aboard, etc. Most of my fishing is within a 10 mile radius of port and in reasonably easy waters – sea lochs, North Sea (Dunbar) and SW Scotland. Of these, only the tide races on the headlands around SW Scotland would bother me in a LL2 – and they bother me in a Warrior too. 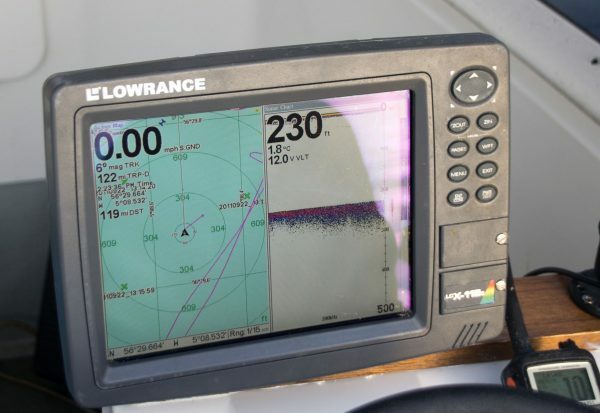 Basically I don’t really need the extra speed or brick like qualities of the 165 hull. 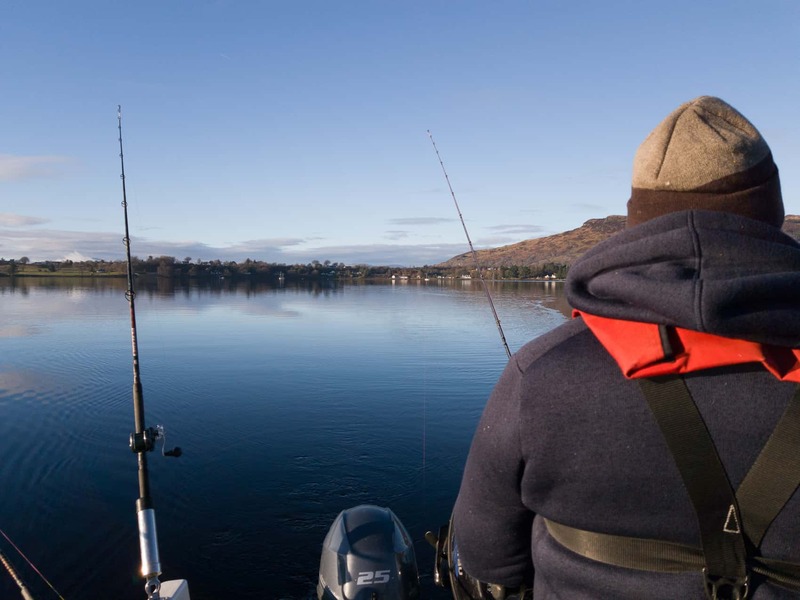 My LL2 will be set up to allow one person to fish and sleep overnight in reasonable comfort; allow two to fish in comfort; or fish three at a bit of a pinch (by comparison I’d regard the Warrior 165 as also fishing two in comfort, three at a pinch. I don’t think you can have four fishing safely on a 165). My longest 1 day trip in a Warrior is over 100 miles, and I expect the same capability from the Longliner 2, once properly set up. Mine is configured with a hard cuddy, console and single seat box. This leaves quite a bit of room for fishing, although laid out differently from the Warrior style boats. I’m still working through the permutations for rod holders, etc. but have fitted a set of rails towards the stern which will help. I took it out for a maiden launch and engine break-in session at the end of June over at Loch Etive. Not much wind but it rained from start to finish so the photos are fewer and soggier than originally planned. You can see the handrails on this photo, just immediately aft of the rowlocks(!). 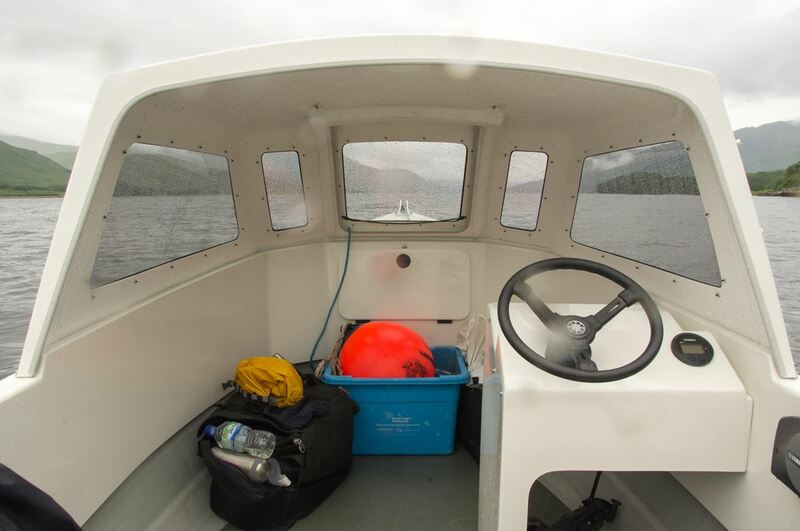 Also the console, which is quite a good size for this class of boat – I haven’t installed anything yet as I wanted a wee play about first before committing to anything. Trim was OK with one aboard, with a slight lean towards max revs (although the rather oversized Tohatsu aux at 25kg helps offset my weight [just a little!]). The cuddy is also a good size and provided decent shelter from the wet stuff. The anchor well is bigger than I thought, shown here with a 5kg Bruce and 10m of heavy chain. I didn’t keep the anchor in here whilst towing as the thought of it flying around in an accident didn’t appeal, but it looks big enough to hold my usual 200m of rope. And a view towards the stern. Planning on putting at least one rodholder on each rail, plus one towards the stern itself. 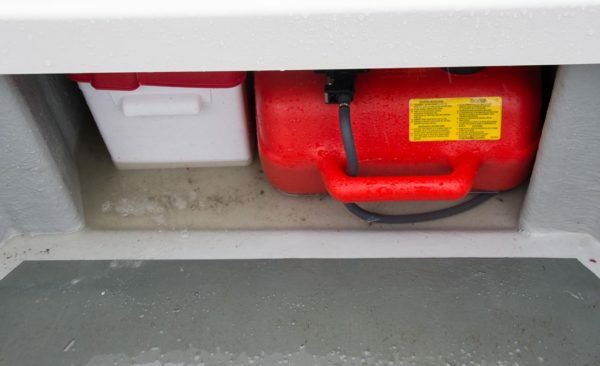 And a slight downside in wet weather – the bilge is too shallow to contain water effectively, so be prepared to bail out during the day if the rain is heavy. A couple more pics – sorry about the stray raindrops and generally grey look, but it was an authentically grey day of the sort that Scotland specialises in! 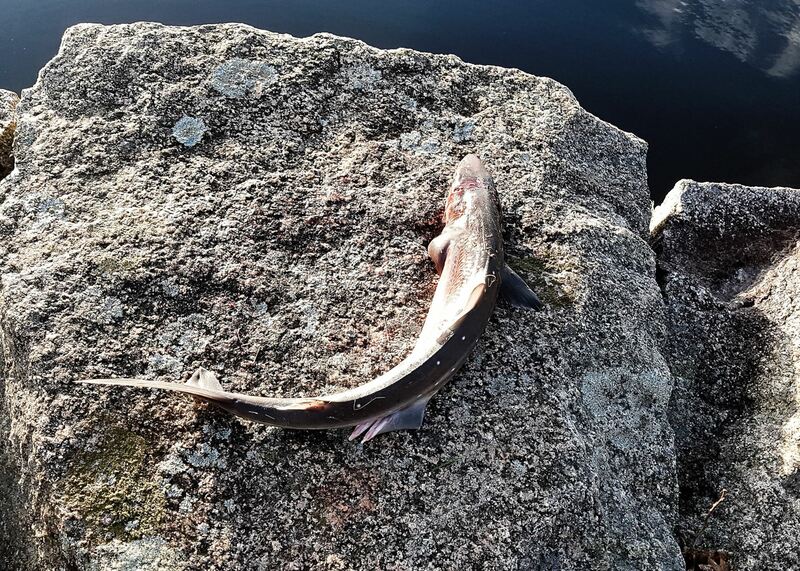 And finally – first fish, being a small and feisty grey gurnard. Overall everything behaved itself, although I picked up a few minor things to change. Performance is a little hard to judge with a new outboard, but I took her up briefly to max revs and hit 23-24mph (20.5 knots) on the GPS, so the claimed 22 knots when lightly laden looks about right given she wasn’t trimmed correctly at the time. Anchoring was easy and she was well behaved in a slight wind against tide situation. Drifting seemed fairly stable, although it wasn’t rough enough to test this realistically.